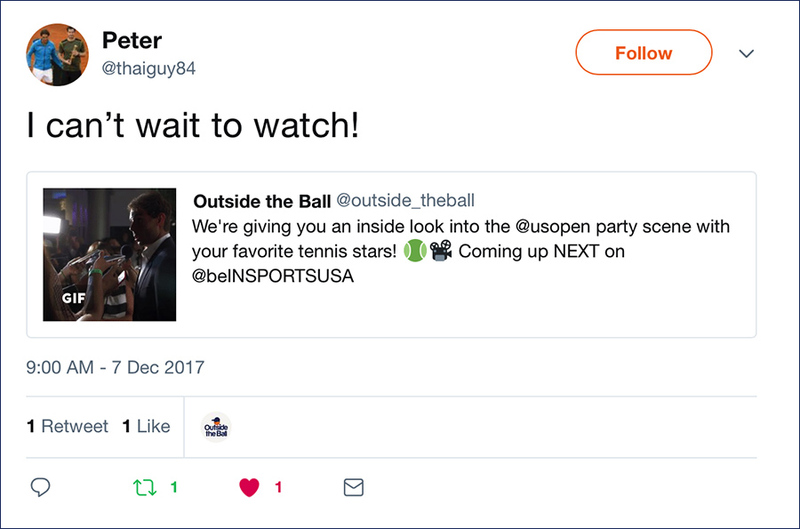 Racquet Comedy, a fan of Outside the Ball, showed off his excitement as he was featured in an episode of OTB TV on beINSports USA. 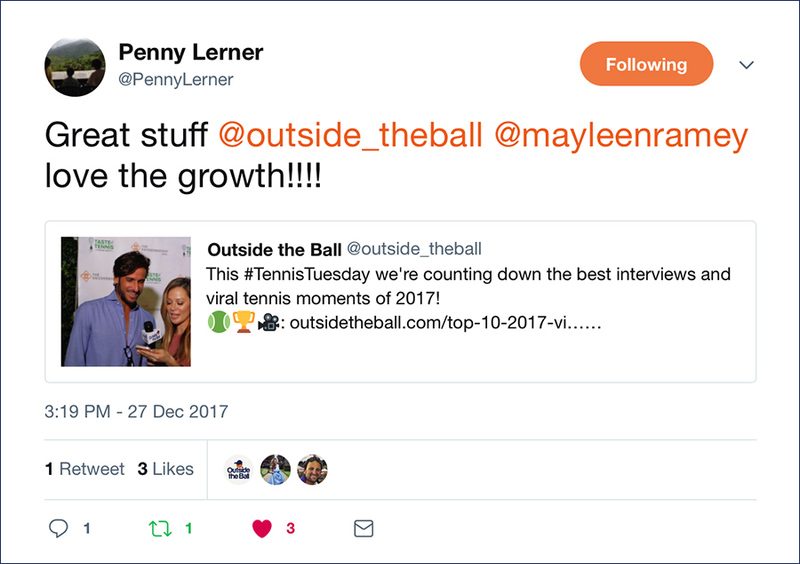 Outside the Ball's Countdown of the best interviews of 2017 got the attention of journalist Abigail Johnson who shared the video with her 1,085+ Twitter followers, as well as AYS Sports CEO Penny Lerner. 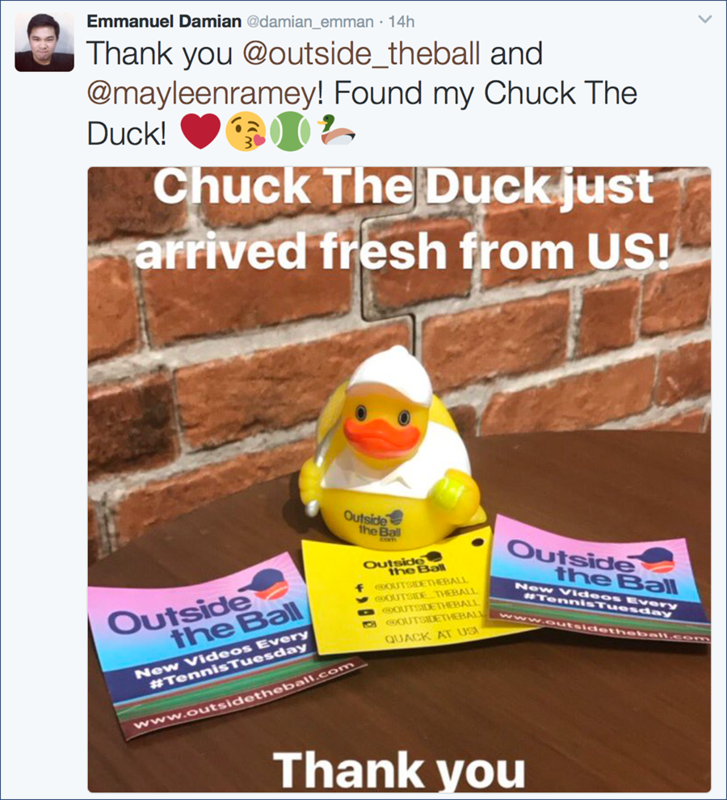 Mascot Chuck the Duck is in very good company as he has made friends all over the world through our fun giveaways! 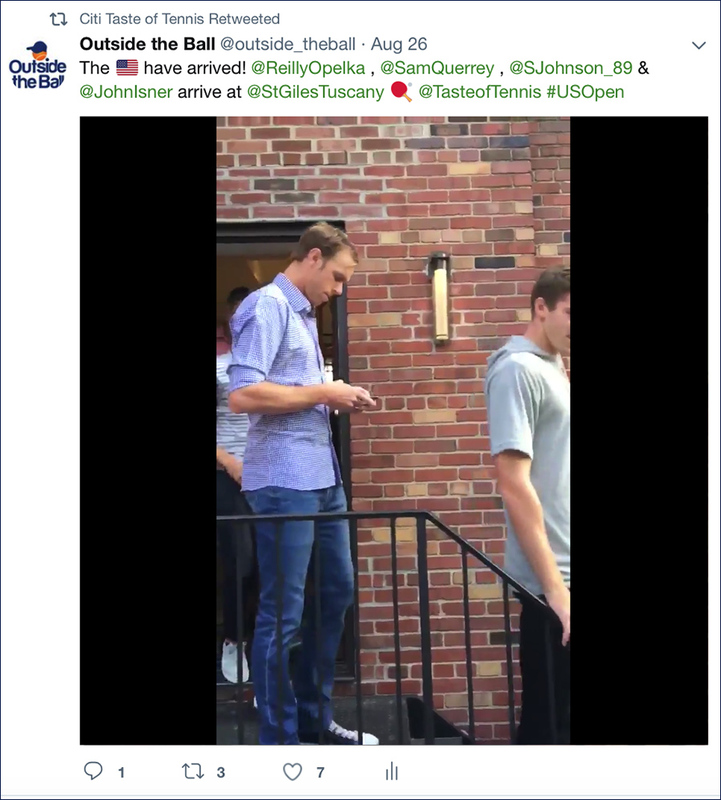 Outside the Ball's Meme makeover continued as Petra Kvitova selected her favorite personalized tennis meme. 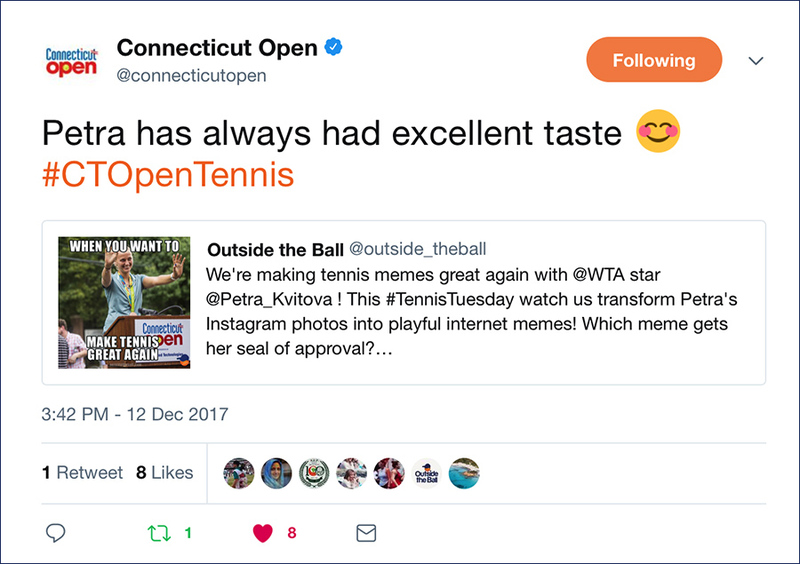 The Connecticut Open shared this playful interview with their 7,788+ Twitter followers. 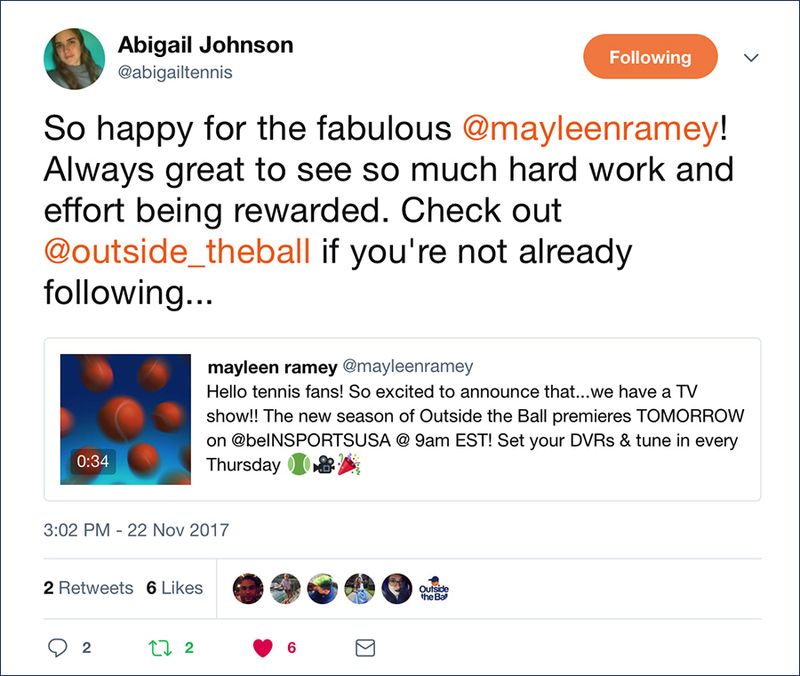 Thanks to USTA #NetGeneration Ambassador Jessica Popiol, Outside the Ball was featured in Tennis Message Magazine as the Social Media account to follow. 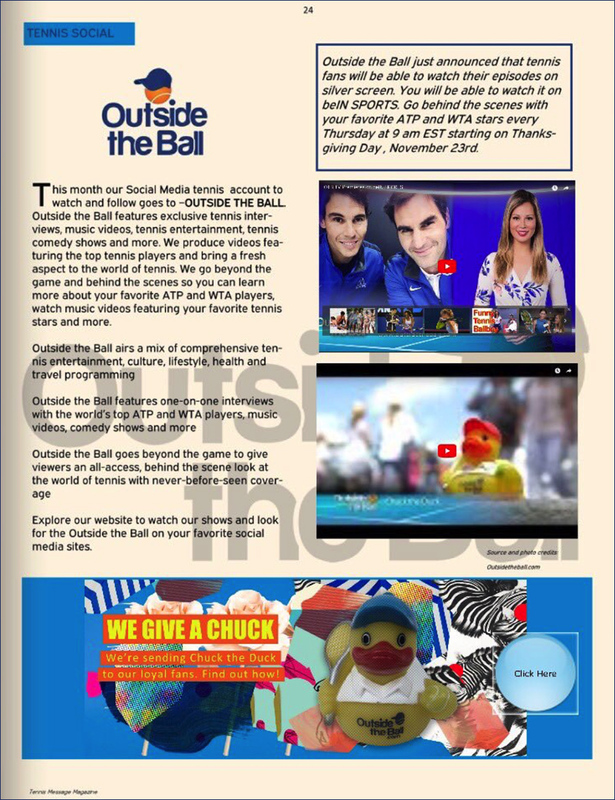 Tennis Message Magazine is a free and interactive online issue that includes photos, videos, and interviews. 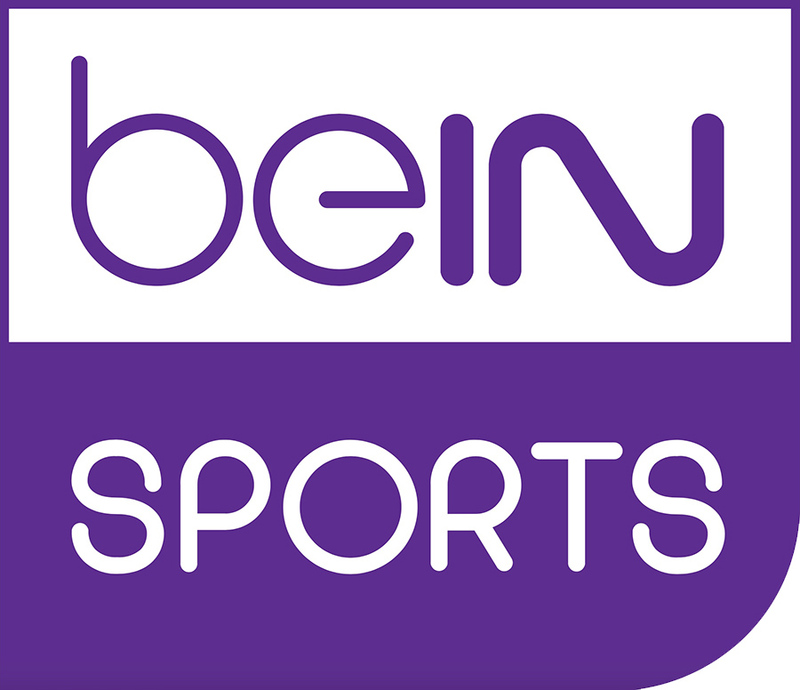 Tennis fans wanted more of Outside the Ball's television series that aired on beINSports. 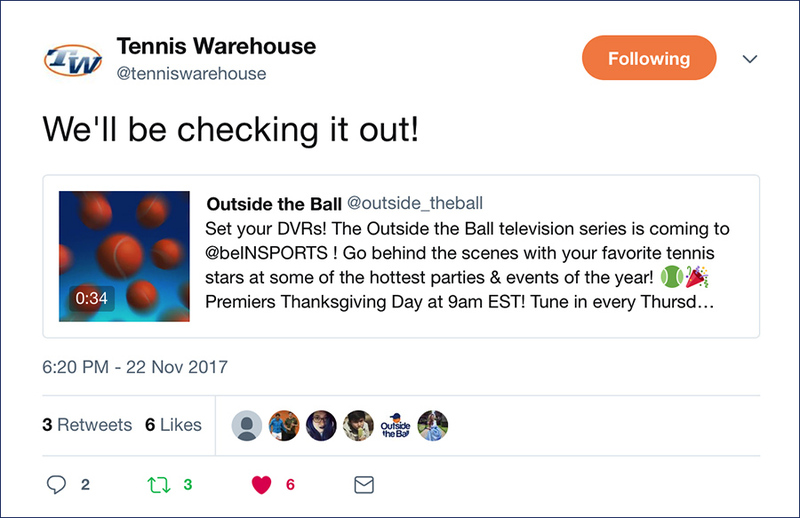 Tennis fans enjoyed all of the wacky and wonderful clips included in Outside the Ball's television series. 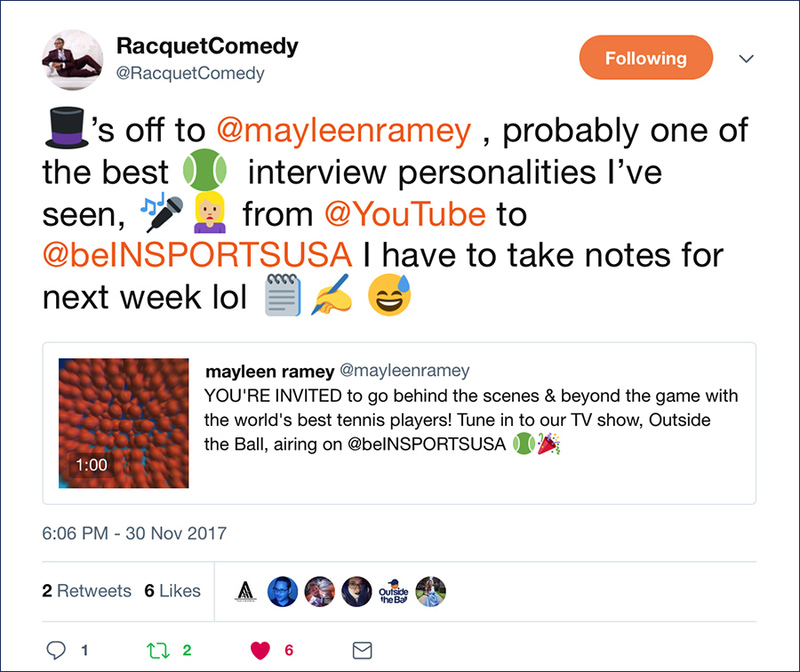 While stuck in traffic, host Mayleen Ramey had a fun carpool dance party with Katie Swan and Cici Bellis. 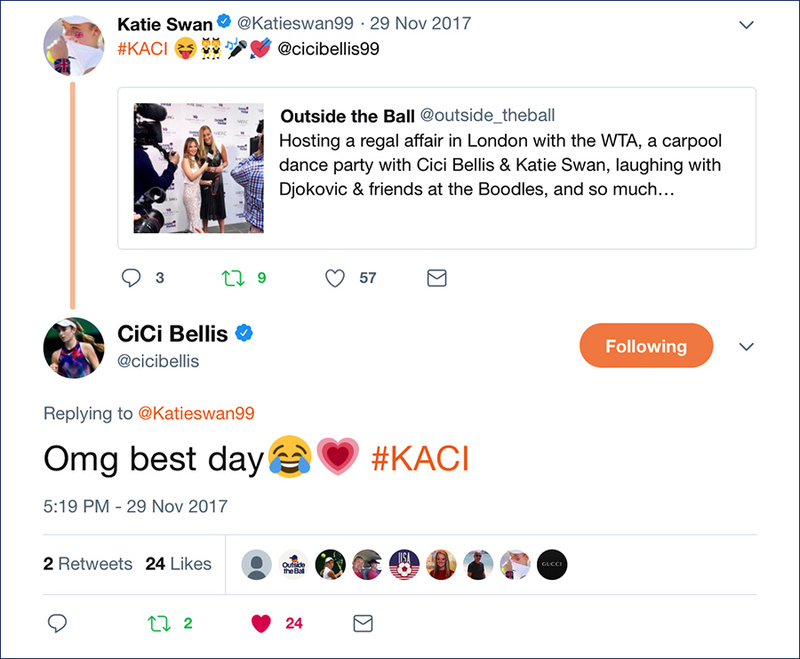 Katie Swan shared the video with her 13,400+ Twitter followers and Cici Bellis (19,000+ followers) also reminisced about the really great day! 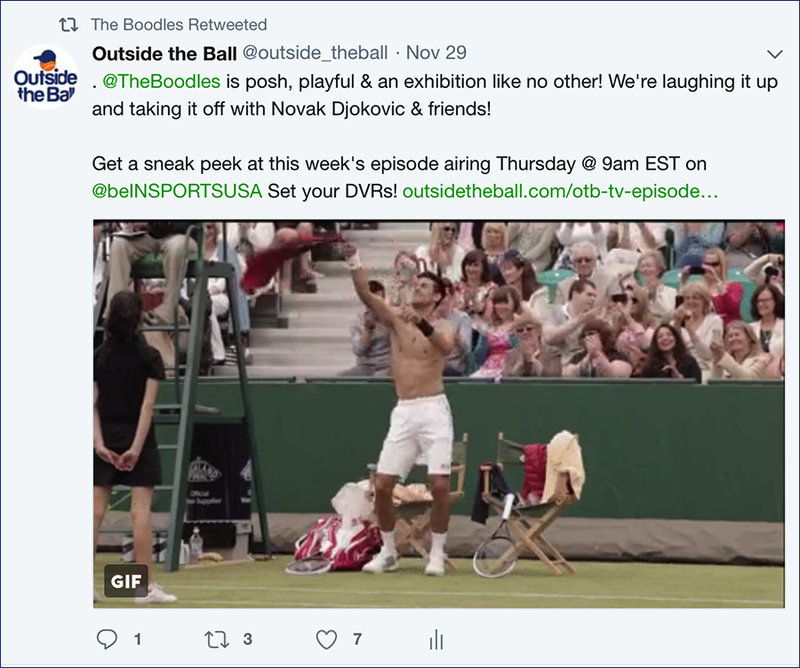 The Boodles with 3,621+ Twitter followers is an exhibition event like no other and they showed their support for the Outside the Ball television show all the way from England. 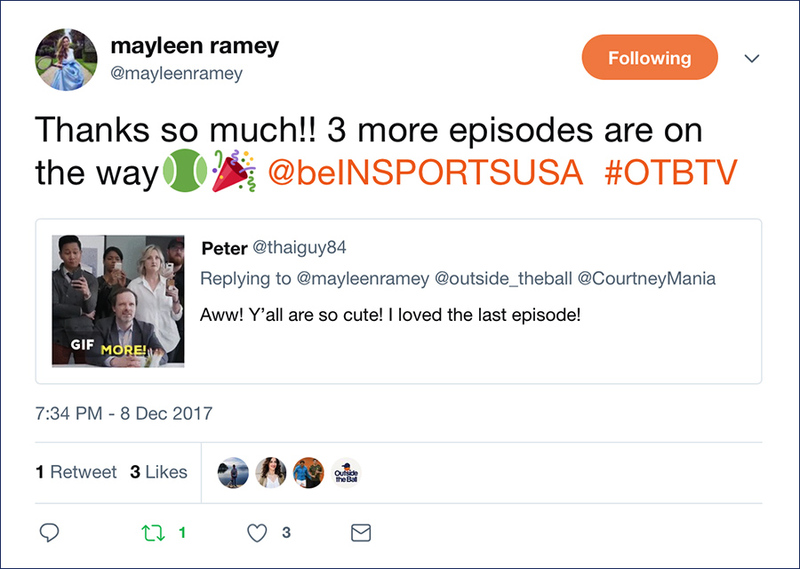 Season Two of Outside the Ball, the TV show will be airing this month on beIN Sports USA. Stay tuned for more details! 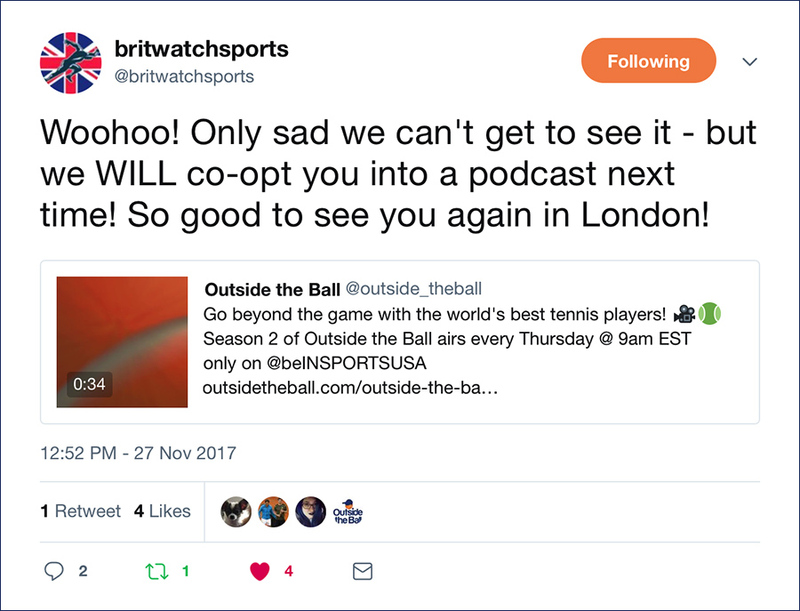 Tennis Served Fresh shared Outside the Ball's BFF Quiz featuring Bethanie Mattek Sands, Lucie Safarova and special guest, Frances Tiafoe. 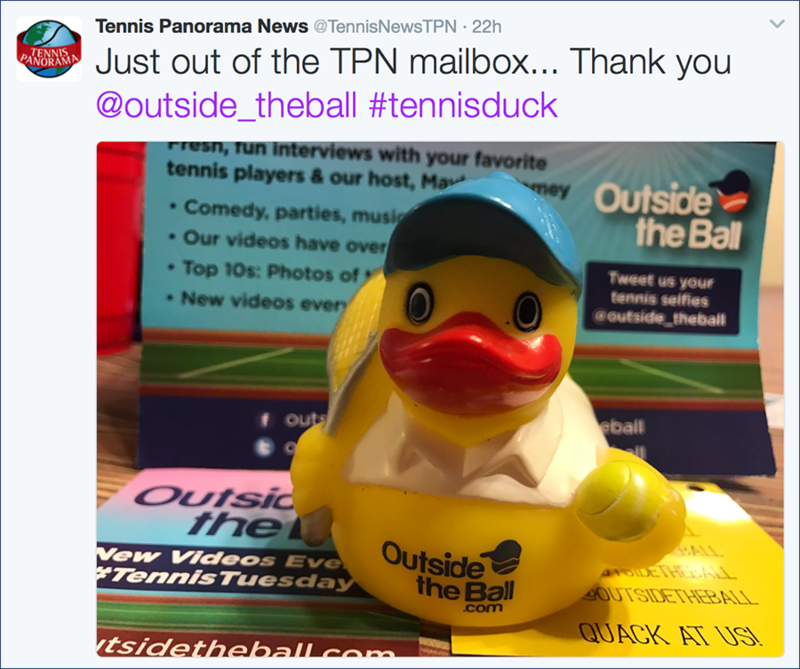 Tennis Served Fresh published the press release along with the hit video to their 5,788+ Twitter followers. 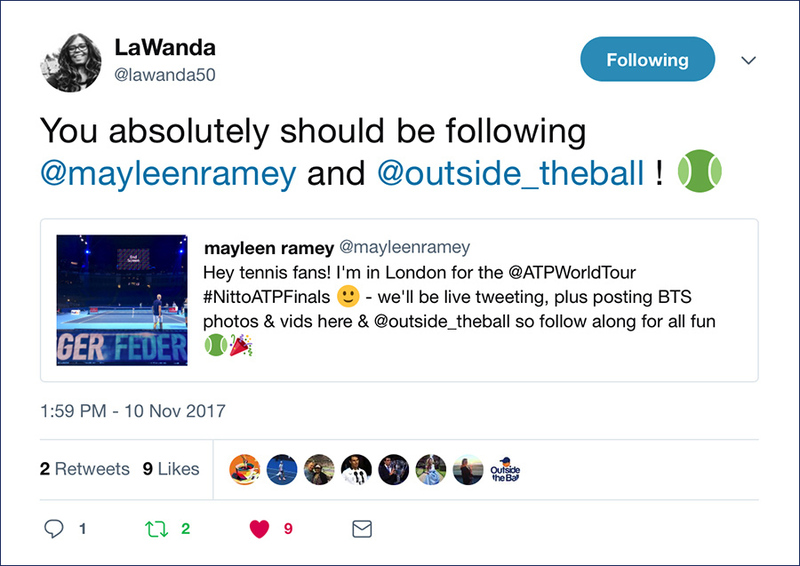 Outside the Ball host Mayleen Ramey headed to London for the 2017 ATP World Finals and fans like LaWanda looked forward to the live tournament content and let her 3,998+ followers know who to follow! Outside the Ball host Mayleen Ramey was a guest at LACOSTE's re-opening of their Rodeo Drive Boutique. 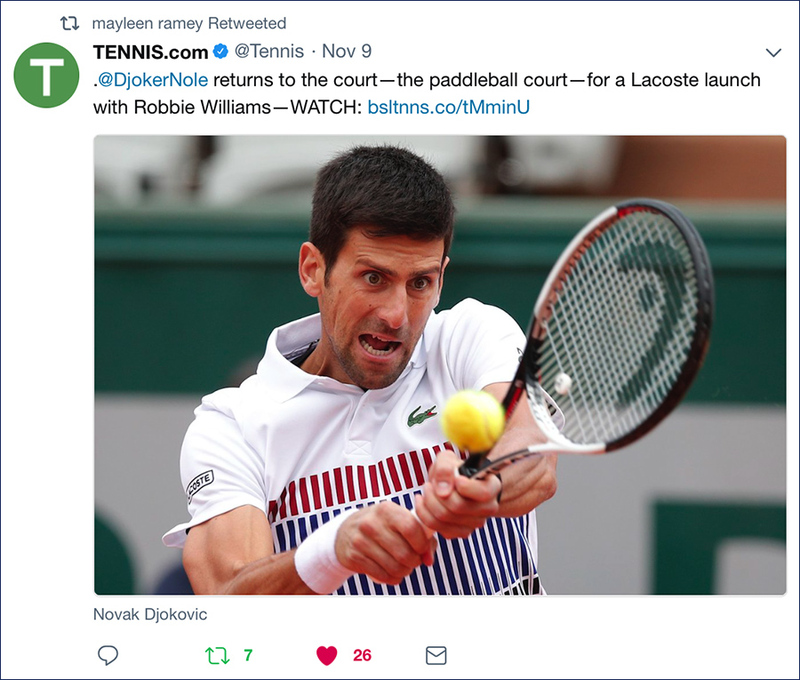 The lively celebration took place at the Sheats-Goldstein residence in Beverly Hills with tennis talent Novak Djokovic hitting the pickleball court with Robbie Williams. 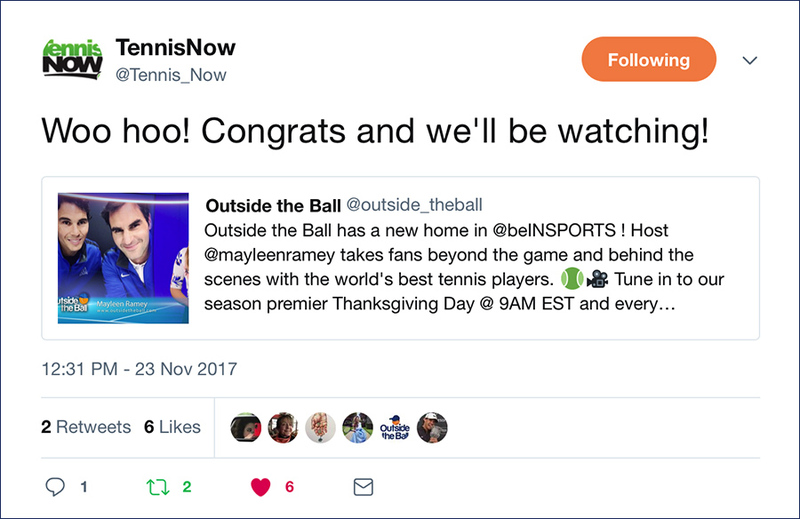 Tennis.com picked up Outside the Ball's live coverage and featured the videos on Baseline. Tennis.com shared the content with their 197,800+ Twitter followers. 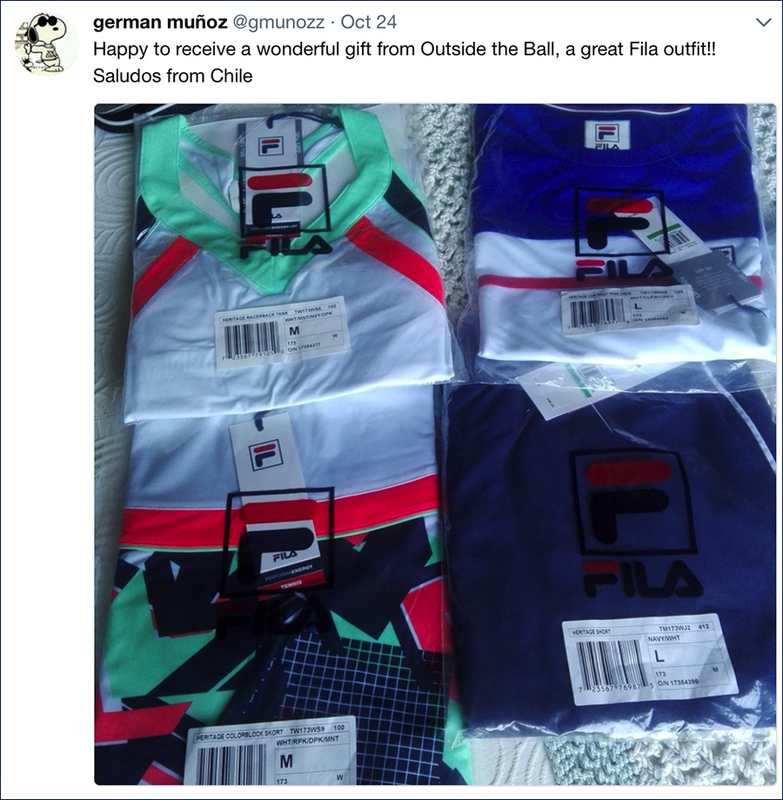 The collaboration between Outside the Ball and FILA meant that one lucky tennis fan was going home with kits from the Heritage Collection as seen on Karolina Pliskova and Marin Cilic at the US Open. German from Chili was the happy giveaway winner! Outside the Ball joined LACOSTE ambassador Christina Mchale at a free tennis clinic in Central Park where the aim of the game was to motivate young people in the NYC community to stay on court. 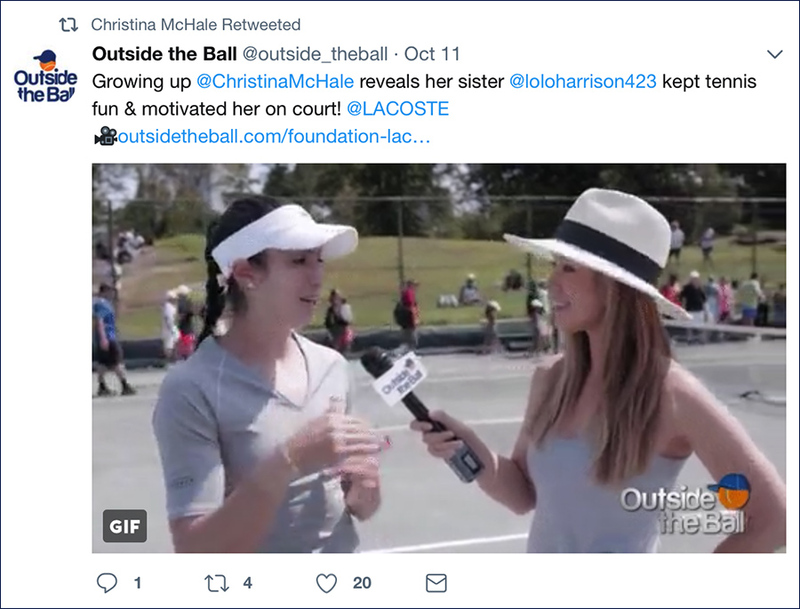 Mchale revealed her sister was beneficial to her earliest years playing tennis. Afterwards Christina shared our interview with her 37,000+ Twitter followers. 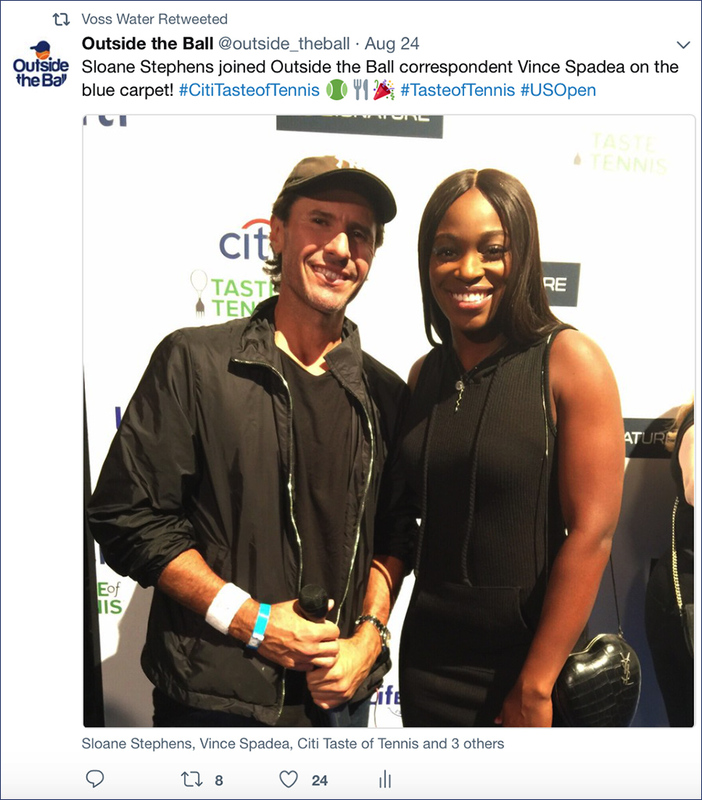 Outside the Ball correspondent Vince Spadea asked the pros delicious questions as they arrived at the Citi Taste of Tennis event in NYC. 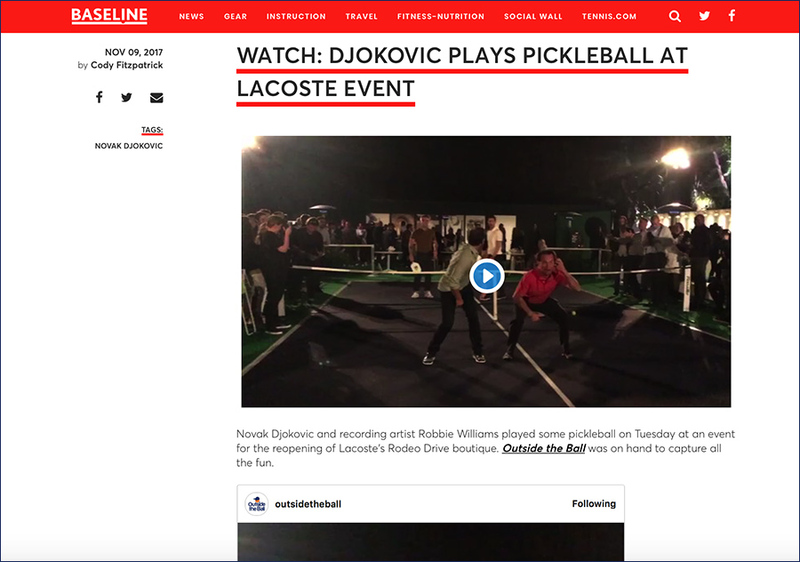 Tennis stars such as Alexander Zverev, Gael Monfils, Genie Bouchard and Heather Watson described what they like to eat, special indulgences, and explained why an event like this one is so well received. 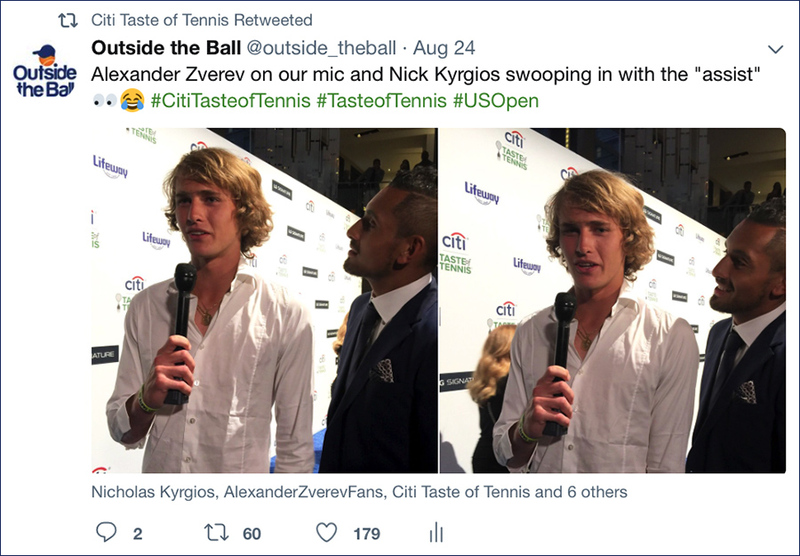 Citi Taste of Tennis themselves enjoyed this interview and shared it with their 6,249+ Twitter followers. 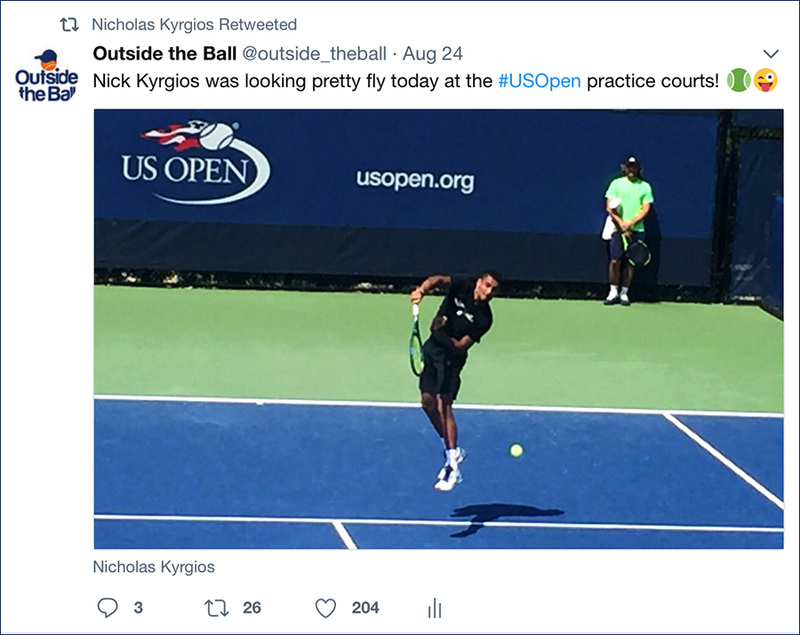 Outside the Ball used Nick Kyrgios' Instagram photos and turned them into playful tennis memes. 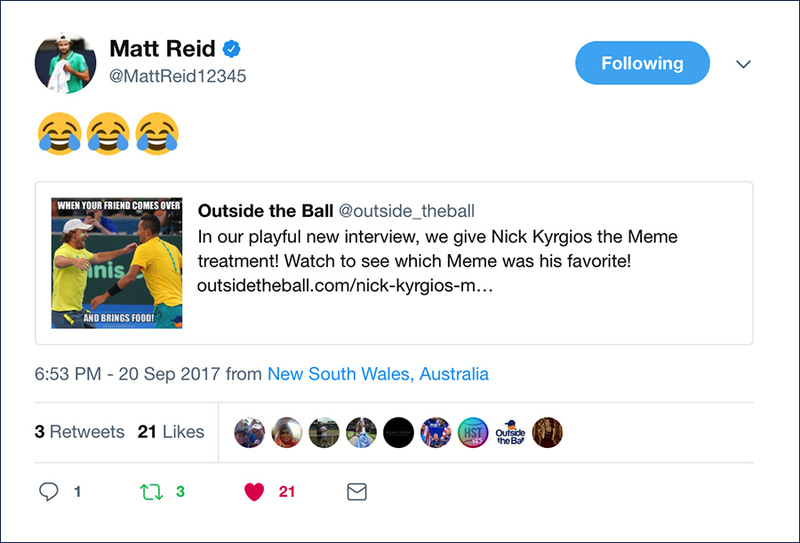 One Meme in particular included fellow Australian Davis Cup teammate Matt Reid who couldn't help but laugh along and shared the meme and the complete interview with his 1,590+ Twitter followers. 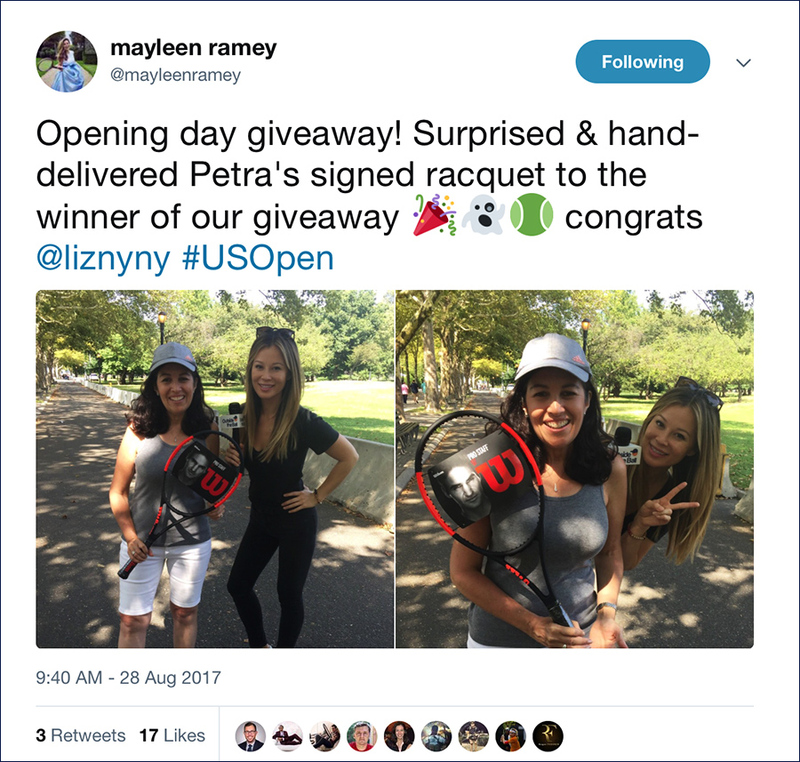 Outside the Ball host Mayleen Ramey surprised giveaway winner Liz Weingart at the US Open with a signed racket from Petra Kvitova. Little did Outside the Ball know, Liz had a surprise of her own. 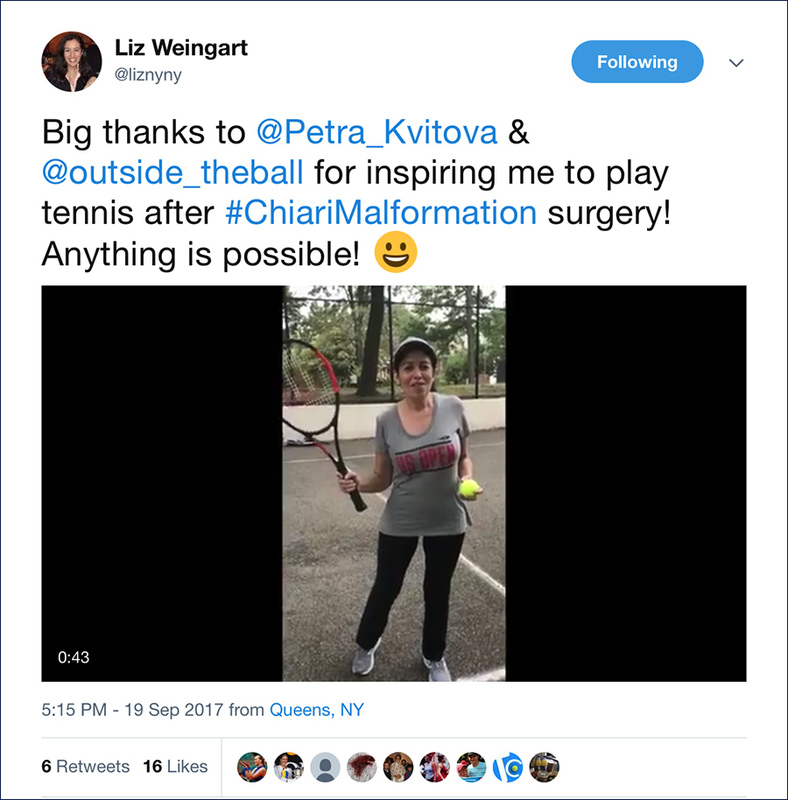 In a heartfelt video that was later uploaded onto Twitter, the NYC native announced she was playing tennis for the first time since recovering from brain surgery, and she became an inspiration to us all. 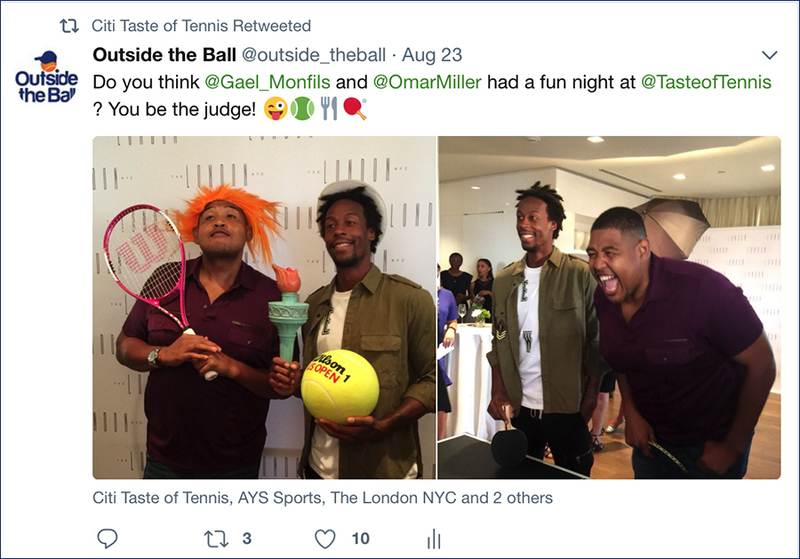 Omar Benson Miller witnessed Outside the Ball host Mayleen Ramey play ping pong at a Taste of Tennis event in NYC with Gael Monfils. 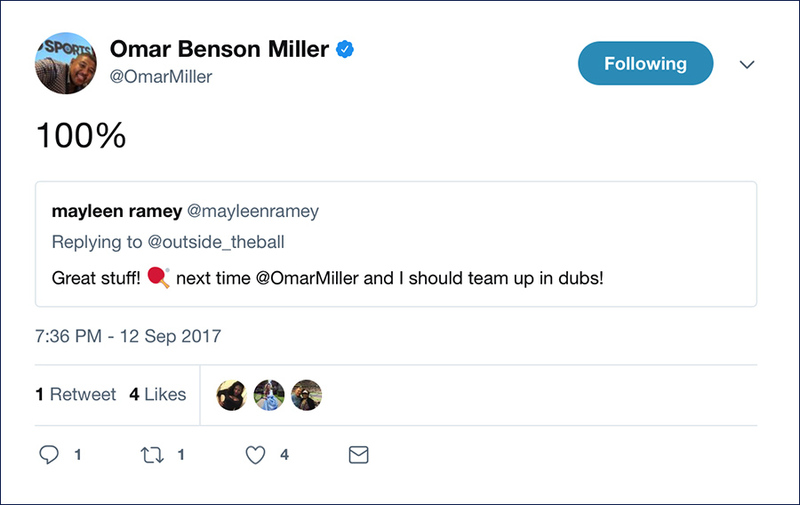 The actor announced to his 66,700+ Twitter followers that he'd like to team up with Ramey in the future. 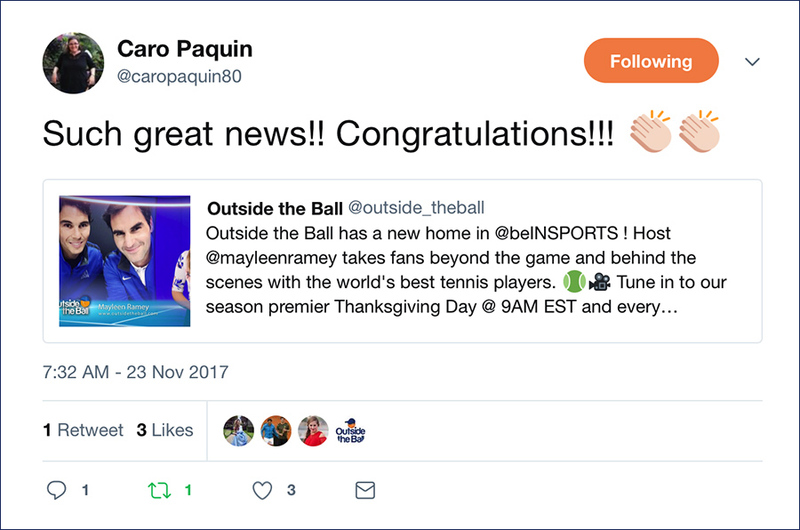 In Outside the Ball's continued segment, Juan Martin del Potro was the latest player to be featured in a Fan Challenge. 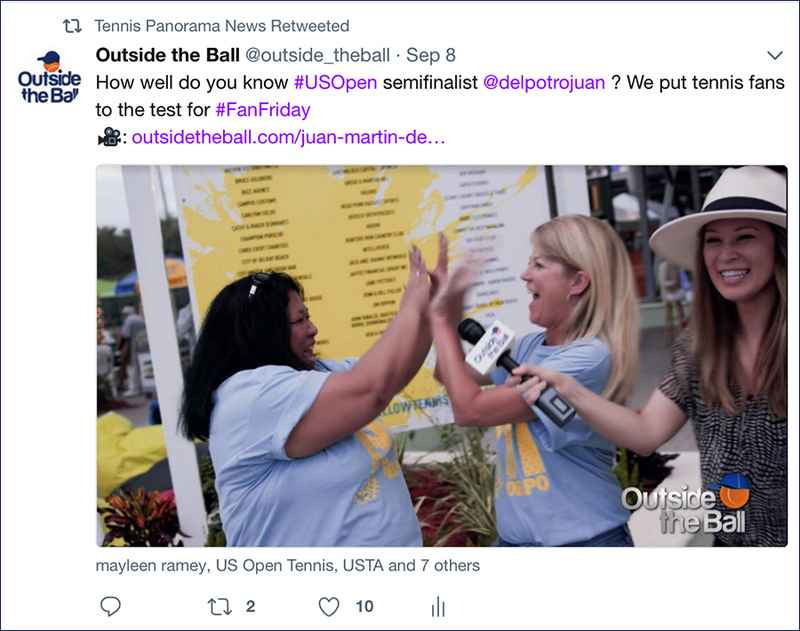 Host Mayleen Ramey put tennis fans to the ultimate test with fun trivia questions about the Argentine star. In this edition fans were given the opportunity to win a signed racket. 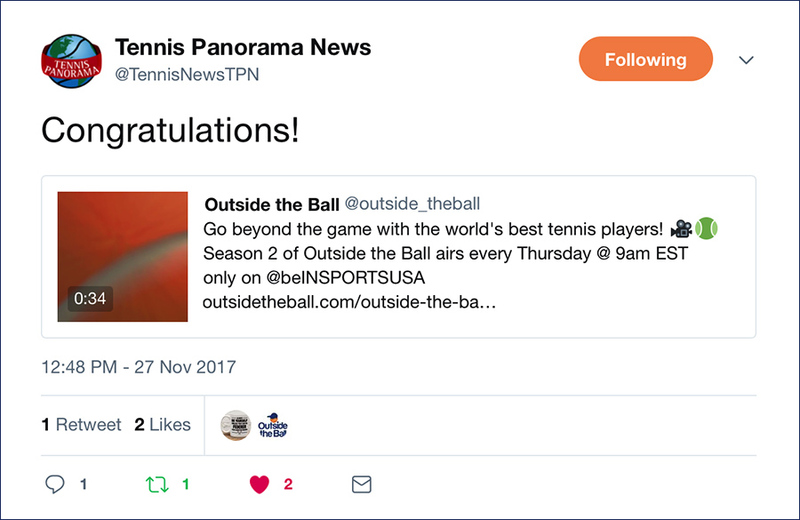 Tennis Panorama News shared the video with their 22,200+ Twitter followers. 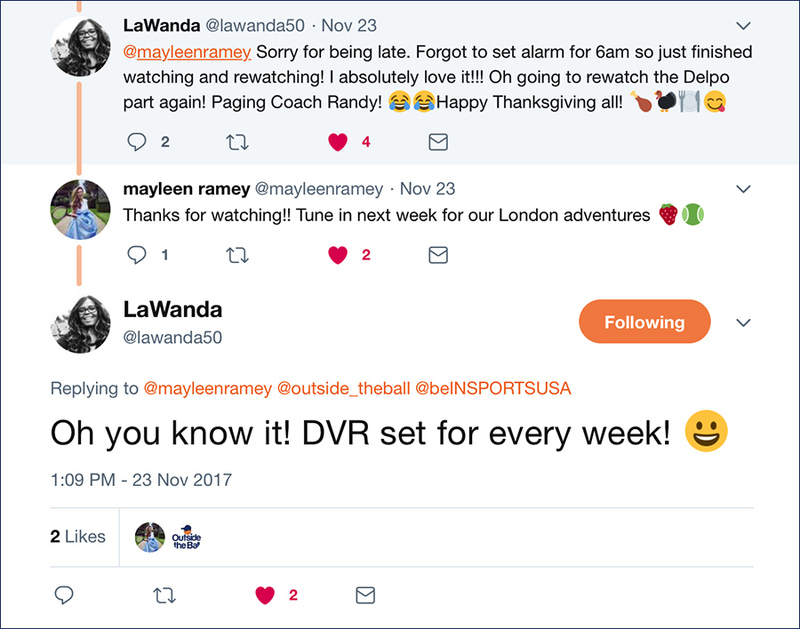 Mayleen Ramey & OTB are in NYC to cover the best parties, events, and tennis in the USA. 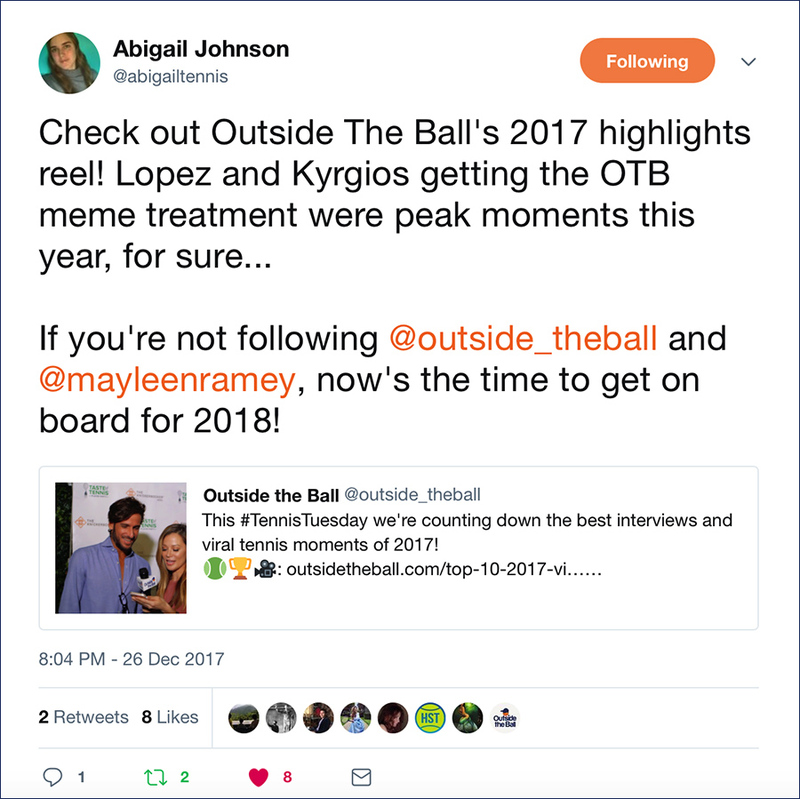 Follow our live coverage and adventures on social media: OTB Twitter, OTB Instagram, Mayleen's Twitter, Mayleen's Instagram. 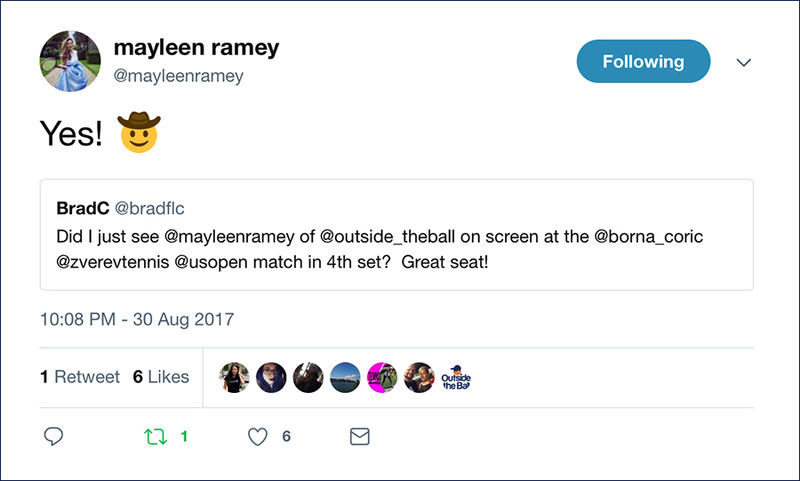 A fan of Outside the Ball spotted host Mayleen Ramey in the crowd at the US Open during a televised match. Outside the Ball joined LACOSTE ambassador and the ambassador of fun, Murphy Jensen, at a free tennis clinic in NYC. The afternoon was filled the LACOSTE pros sharing their tennis tips to enthusiastic kids and a lot of fun. 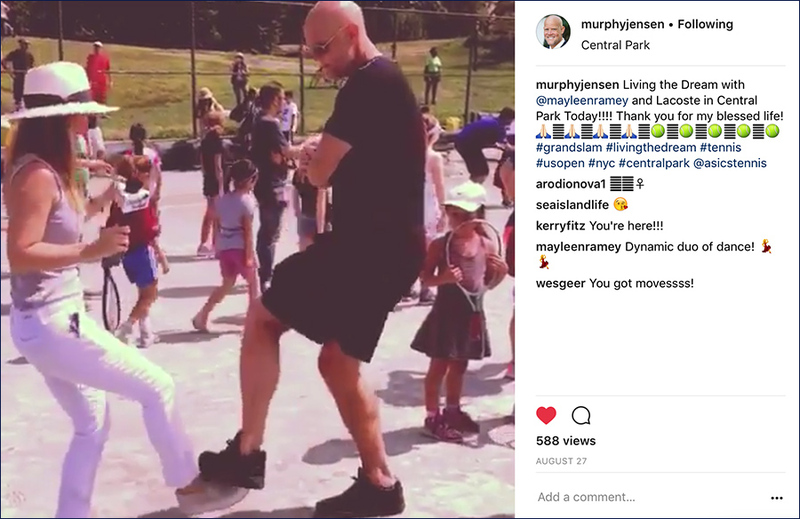 Jensen posted a video of him and Outside the Ball host Mayleen Ramey having a dance break to his 1,833+ Instagram followers. 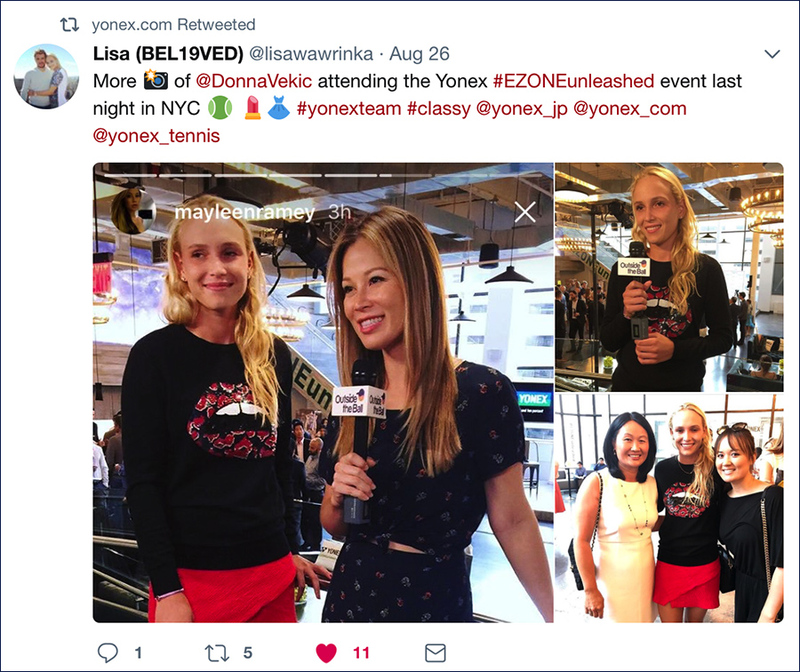 A tennis fan shared moments from the Yonex EZONE racket launch featuring Outside the Ball host Mayleen Ramey interviewing Donna Vekic. 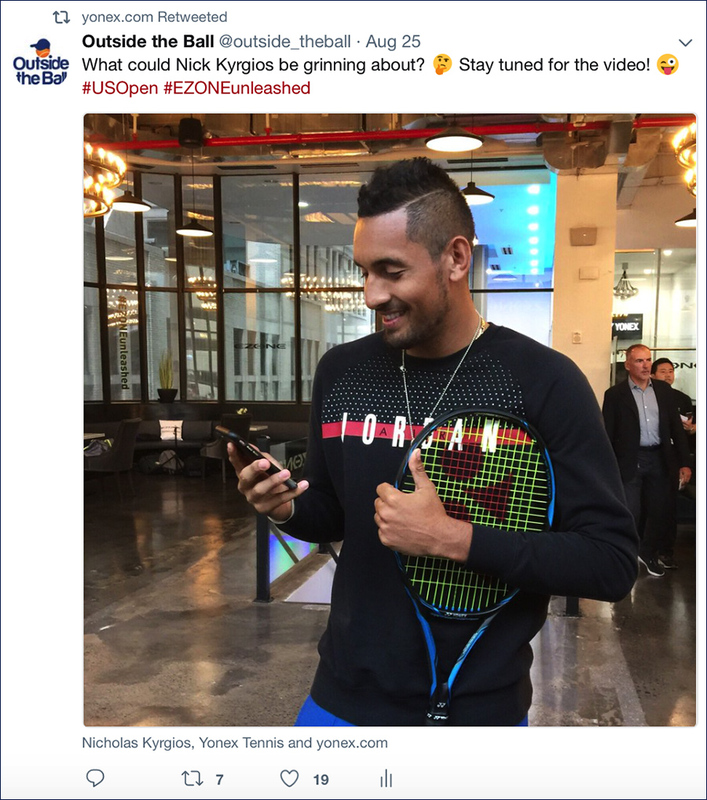 Yonex shared the memories with their 32,600+ Twitter followers. 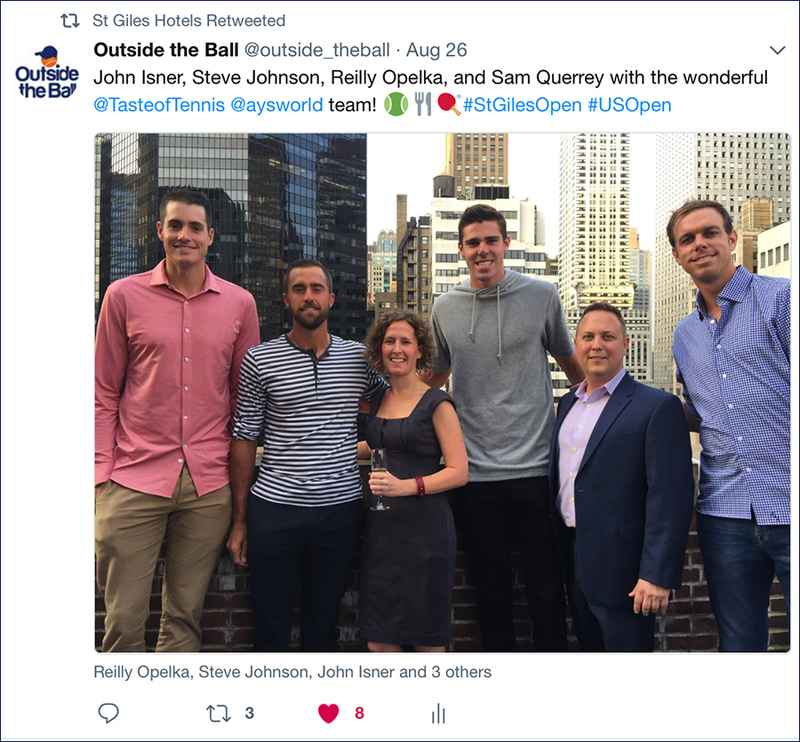 Outside the Ball joined American tennis stars John Isner, Sam Querrey, Steve Johnson and Reilly Opelka at a rooftop event with Citi Taste of Tennis at the beautiful St Giles Hotel. 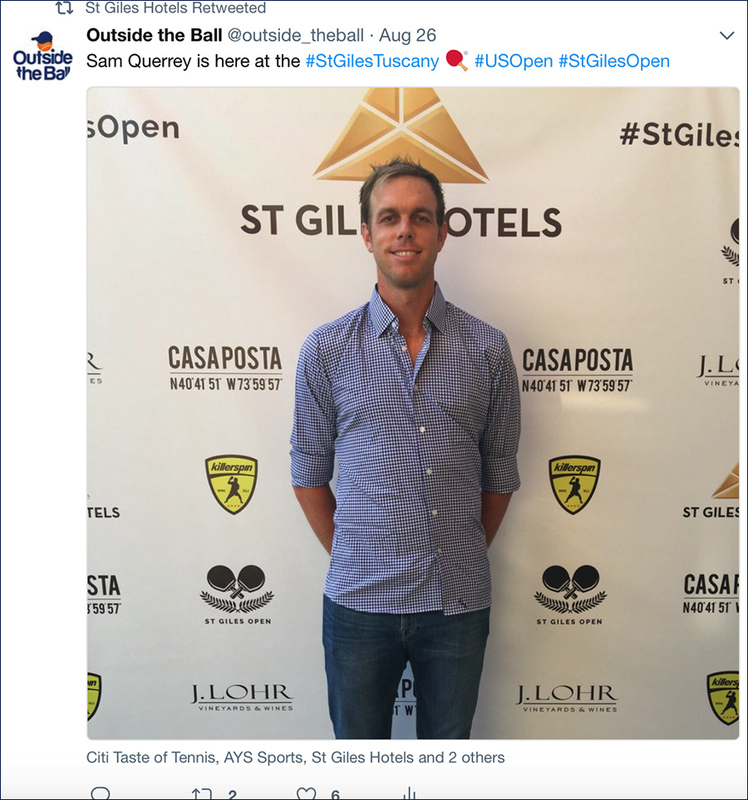 Our live coverage from the event was shared by Citi Taste of Tennis to their 6,249+ Twitter followers, as well as the ST Giles Hotel to their 509+ Twitter followers. 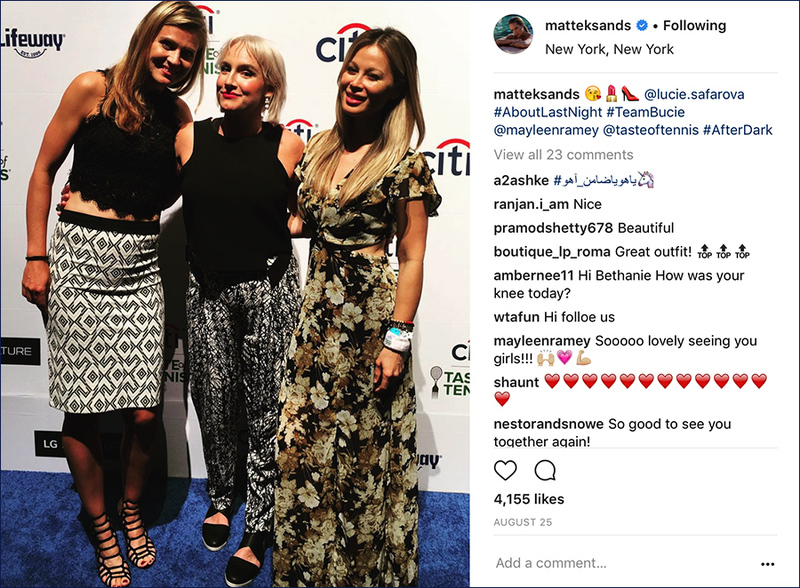 Bethanie Mattek Sands shared this photo from Citi Taste of Tennis where her doubles partner Lucie Safarova and Outside the Ball host Mayleen Ramey enjoyed good food, dancing, and a lot of fun. Mattek-Sands shared the photo with her 77,400+ Instagram followers. 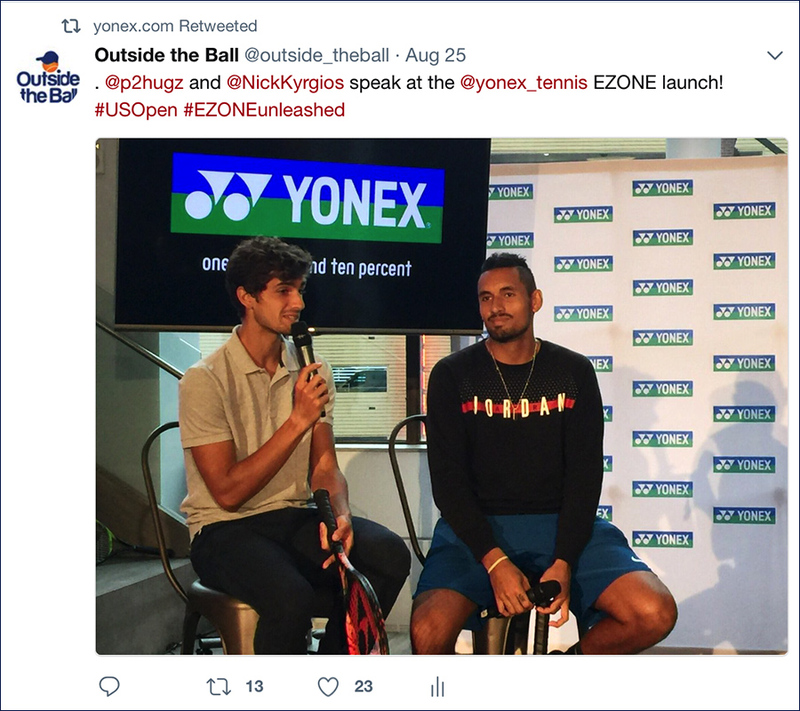 Outside the Ball covered the EZONE racket launch and interviewed Yonex sponsored stars such as Nick Kyrgios, Casper Ruud, Angelique Kerber, and Donna Vekic. 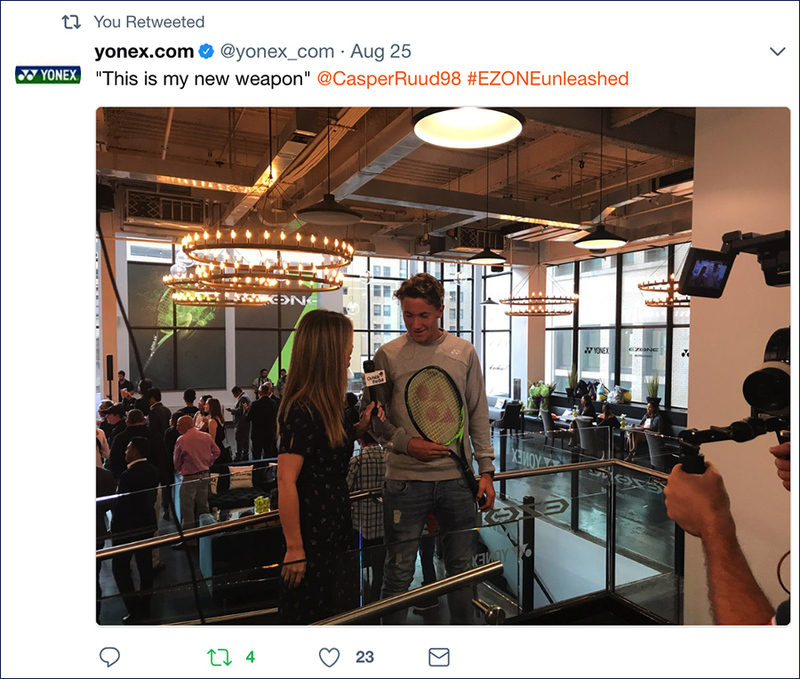 Yonex shared our live coverage to their 32,600+ Twitter followers. 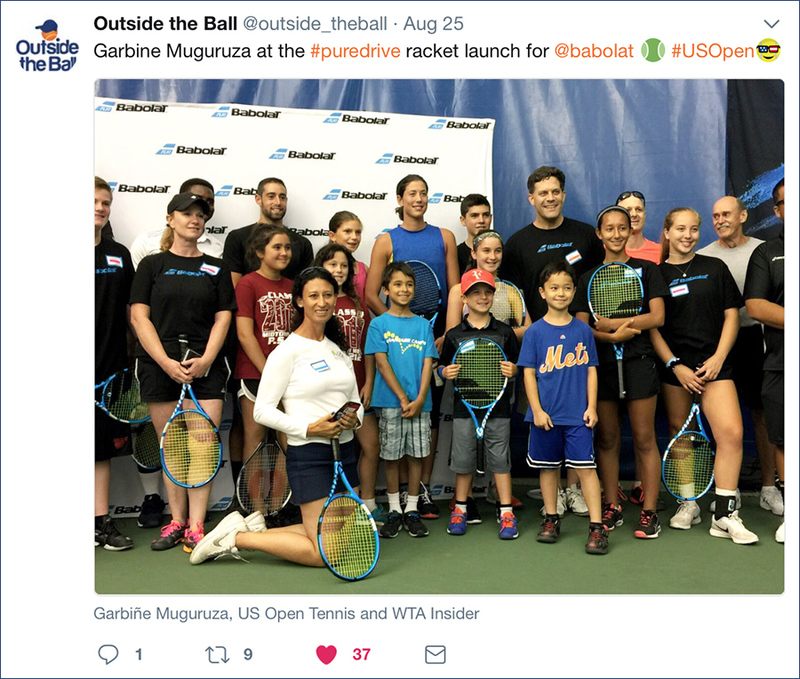 Outside the Ball was in attendance at Babolat's Pure Drive Racket Launch, a fun event featuring sponsored pros like Garbine Muguruza, Fabio Fognini and retired legend Kim Clijsters. 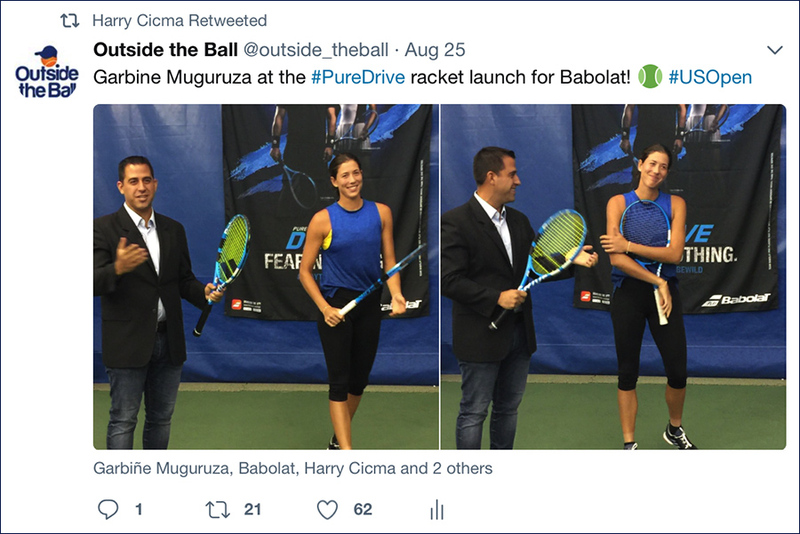 Harry Cicma shared our live coverage to his 3,129+ Twitter followers. 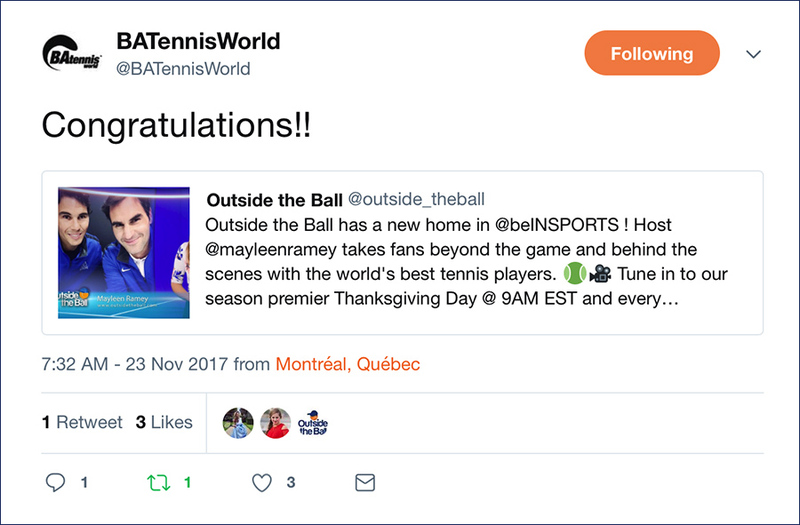 Actor Omar Benson Miller took over Tennis Channel with a continuing series, Advantage Omar that showcased his time in New York City. 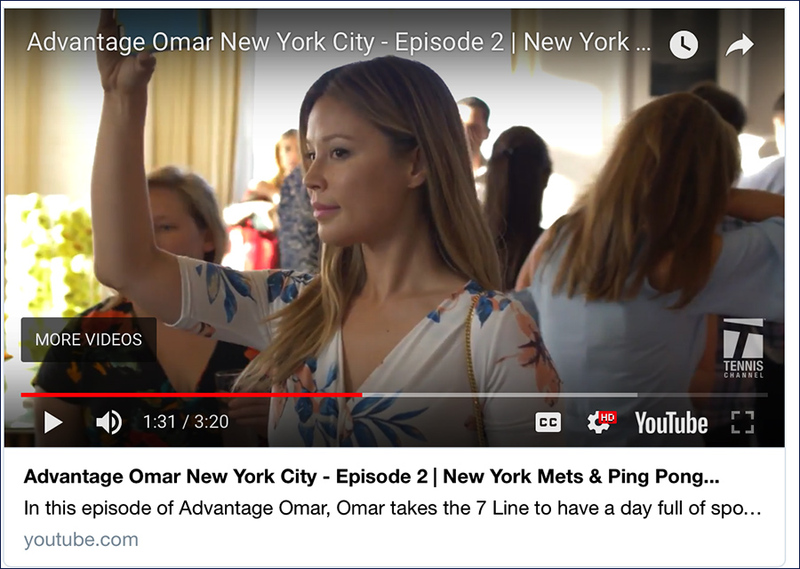 Episode 2 of Advantage Omar included footage from the Taste of Tennis ping pong event where Outside the Ball host Mayleen Ramey made a cameo appearance. 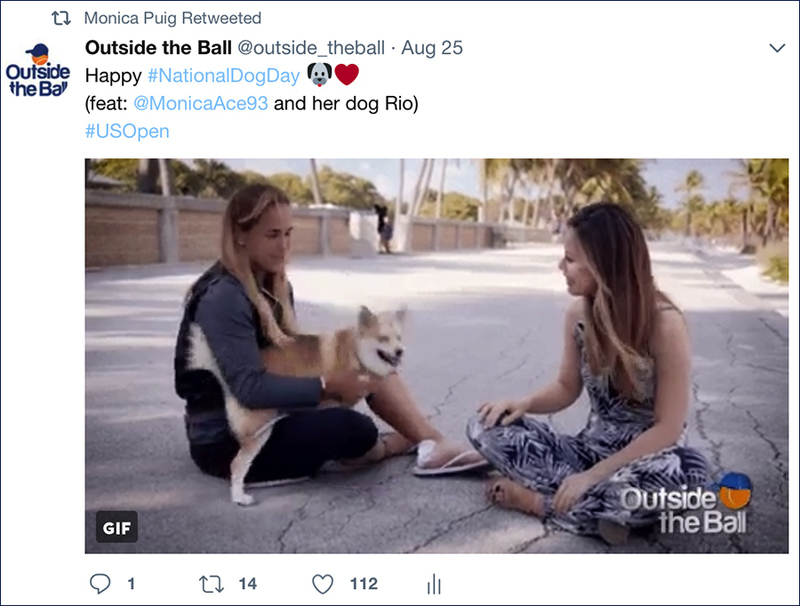 Monica Puig celebrated National Dog Day by sharing a gif from Outside the Ball's interview with the tennis star and her dog Rio. 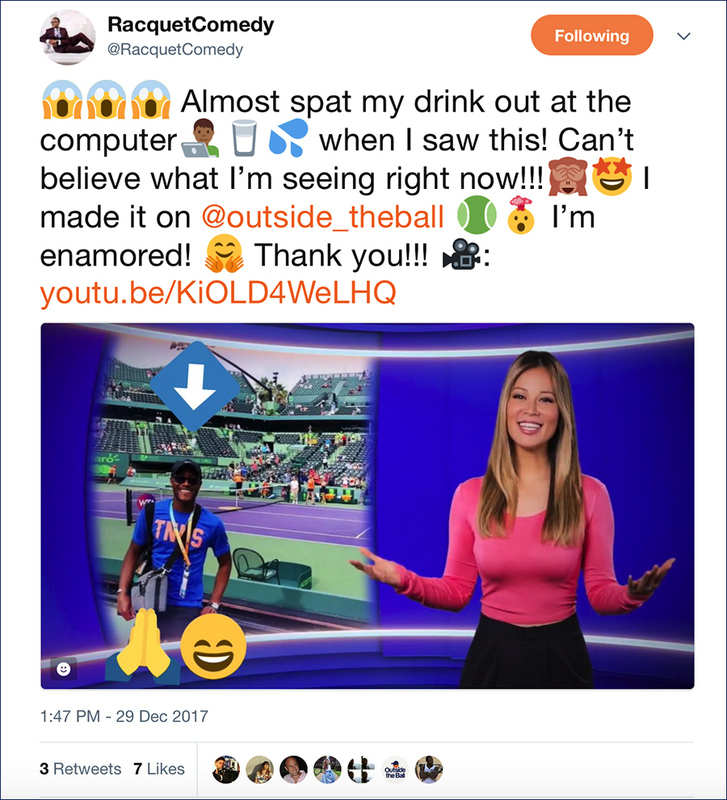 Puig shared the post with her 181,000+ Twitter followers. 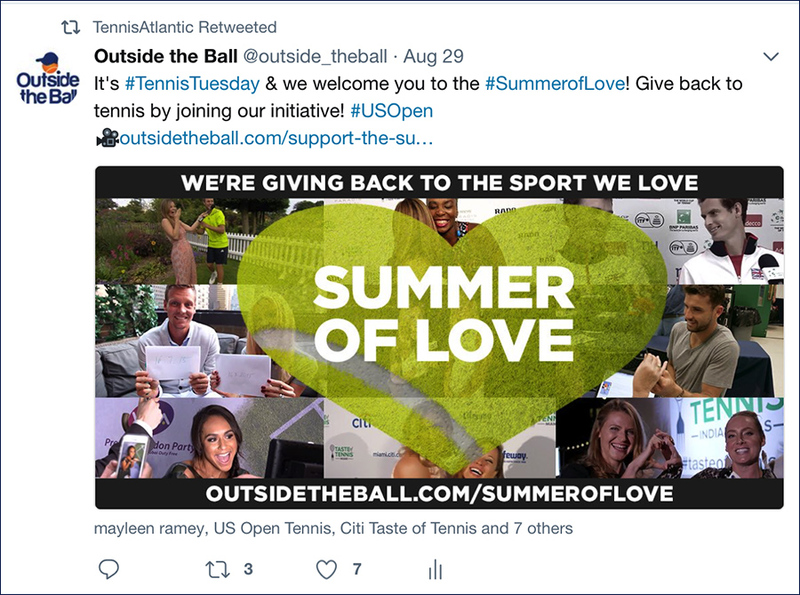 Tennis Atlantic shared Outside the Ball's Summer of Love Initiative with their 5,596 + Twitter followers. 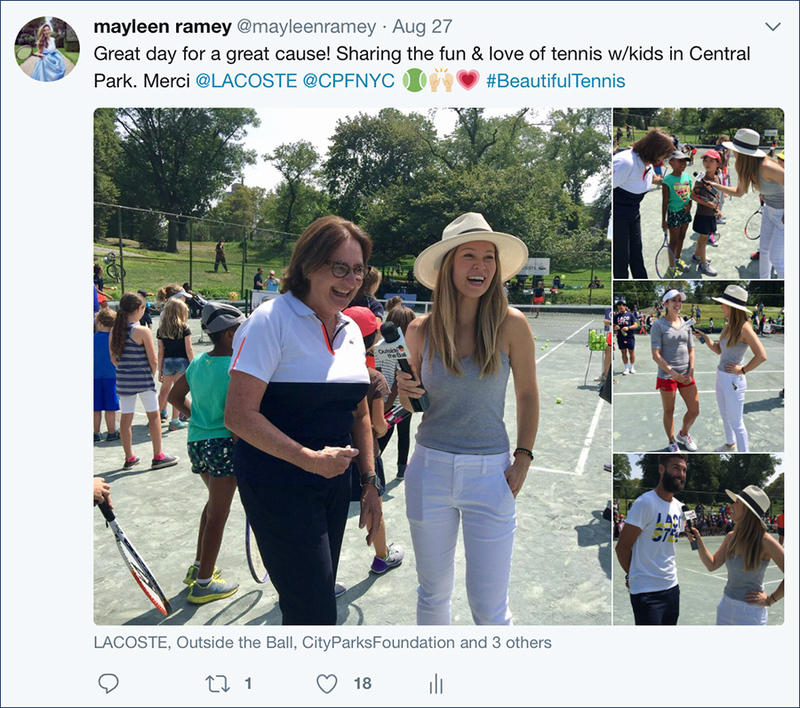 The Summer of Love Initiative was a charitable effort to support non profit tennis organizations that use tennis and education to change lives. 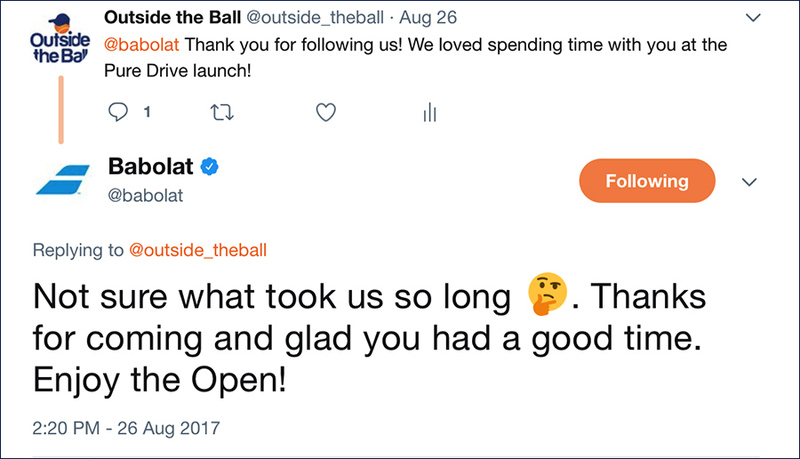 Outside the Ball's Twitter account was the place to be ahead of the US Open while players danced and dined at promotional events like Citi Taste of Tennis. 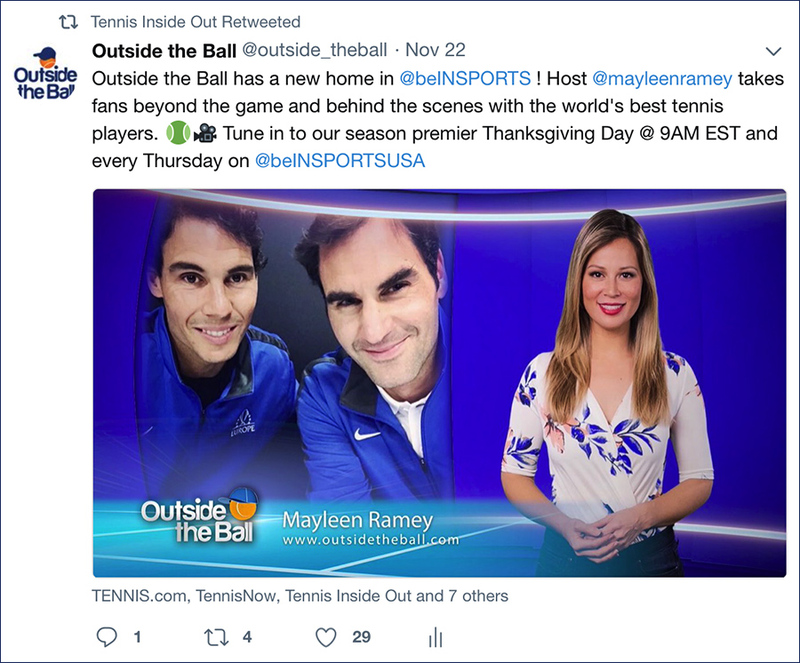 While Outside the Ball was sharing live images and video from Citi Taste of Tennis, Tennis Panorama News was encouraging their 22,100+ followers to give the account some love. 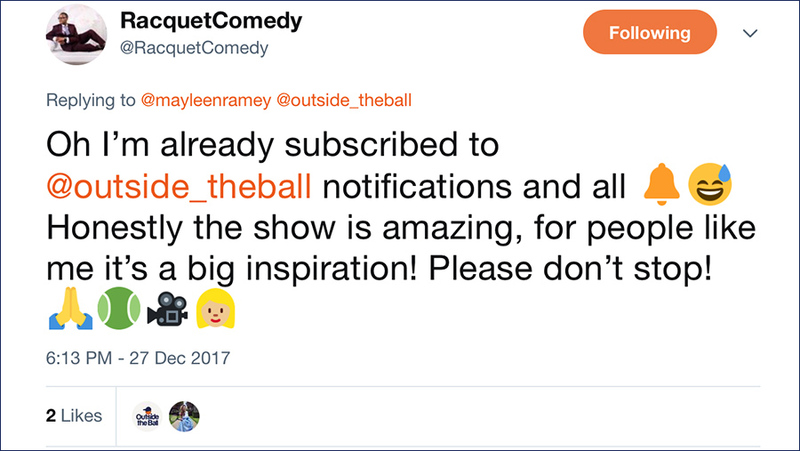 Notable tennis fan Lawanda also encouraged her 3,773 followers to support Outside the Ball. One tennis fan in particular couldn't get enough of the photos coming in live from the Citi Taste of Tennis blue carpet! 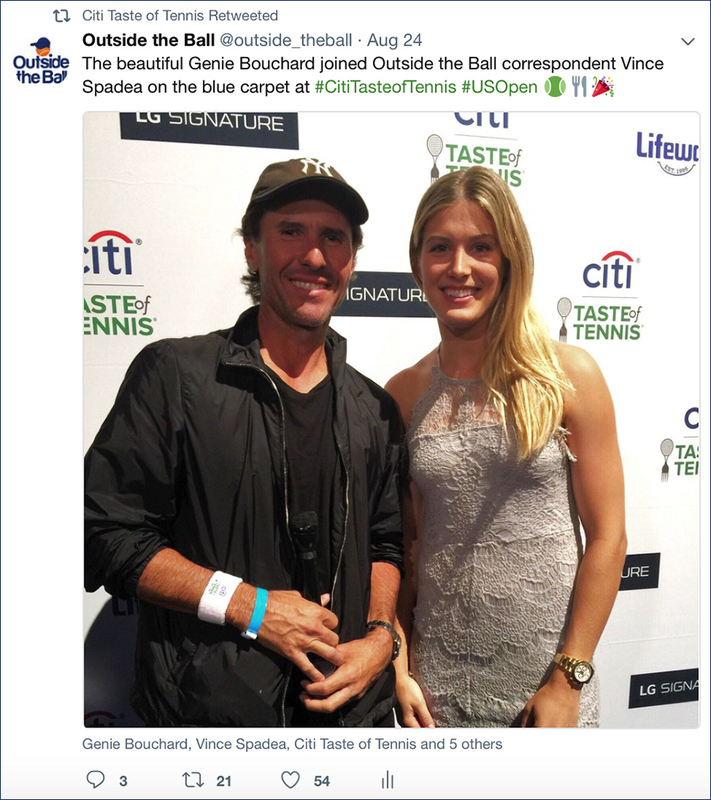 Outside the Ball correspondent Vince Spadea was live on the Citi Taste of Tennis blue carpet as players arrived for an incredible night at Citi Taste of Tennis NYC. 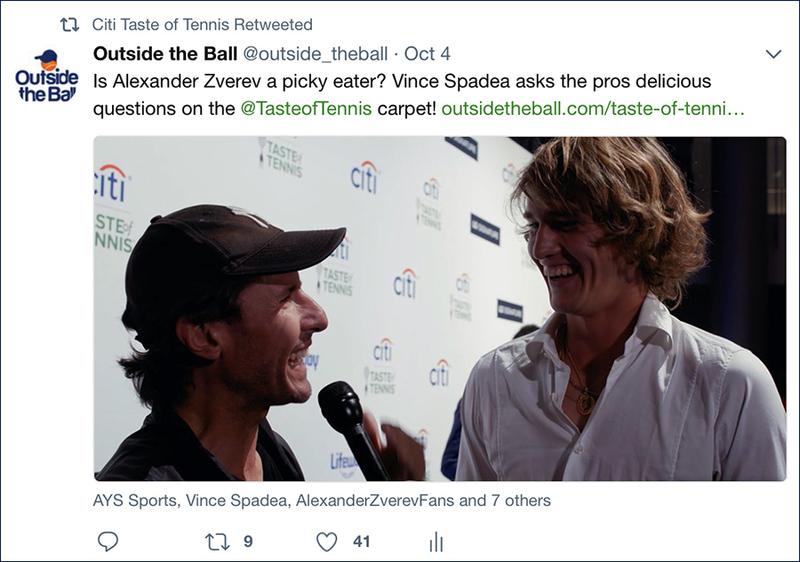 Spadea chatted with ATP and WTA tennis stars such as Alexander Zverev, Nick Kyrgios, Genie Bouchard, Andrea Petkovic and so many more. 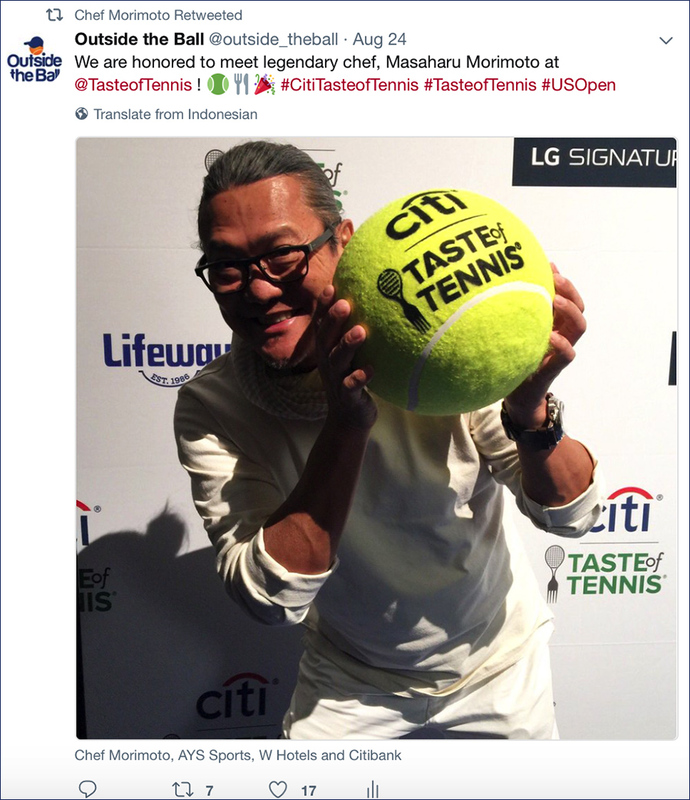 The Citi Taste of Tennis event shared the live coverage to their 6,246+ Twitter followers. 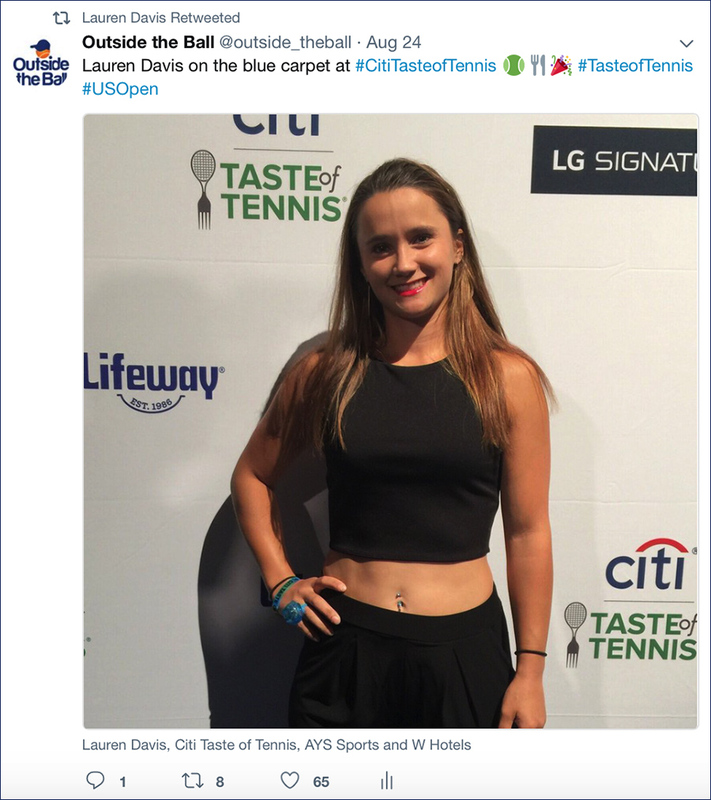 American Lauren Davis posed for Outside the Ball on the Citi Taste of Tennis blue carpet and later shared this look with her 15,200+ Twitter followers. 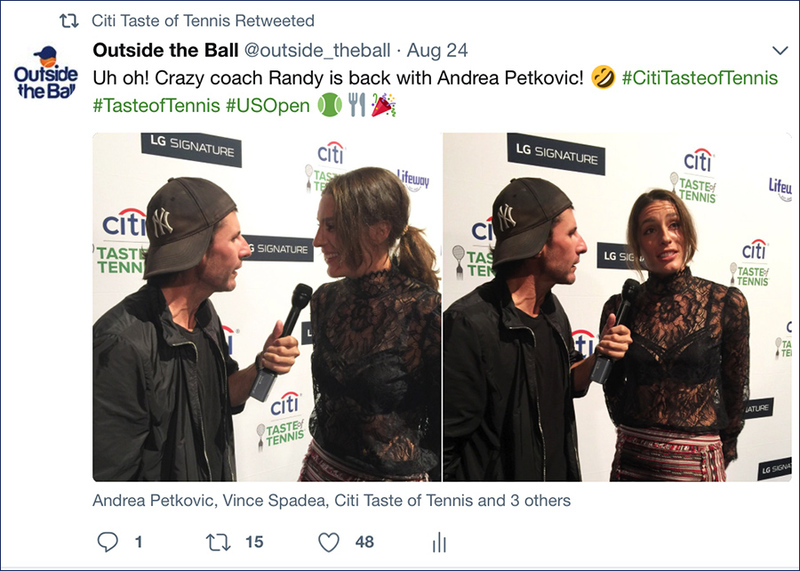 Citi Taste of Tennis combines tennis players with top chefs for a night of good food and a lot of fun. 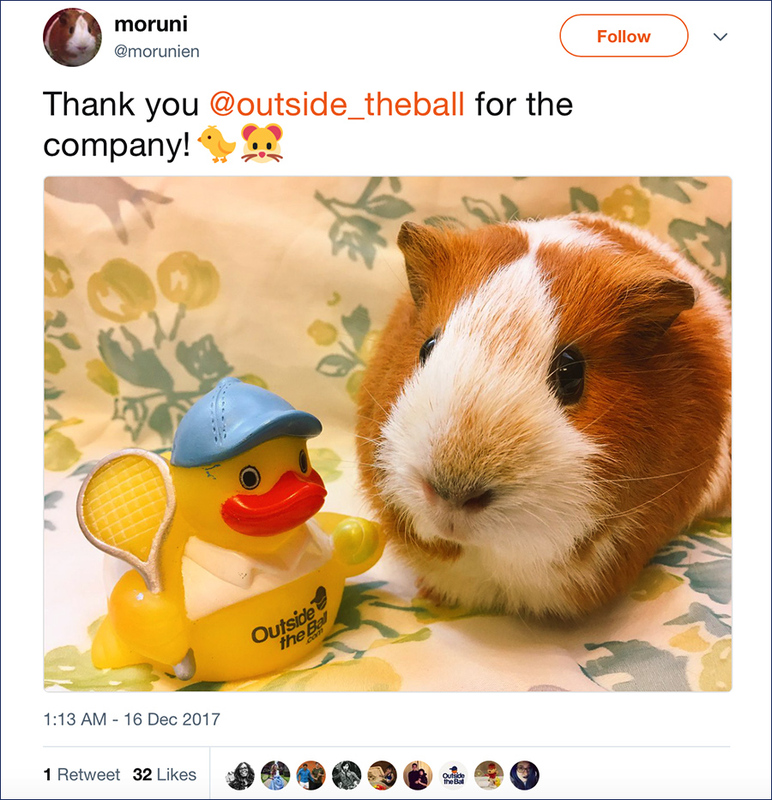 During the event, Outside the Ball had the honor of meeting a cooking icon, Chef Masaharu Morimoto who was kind enough to share this fun photo with his 114,500+ Twitter followers. 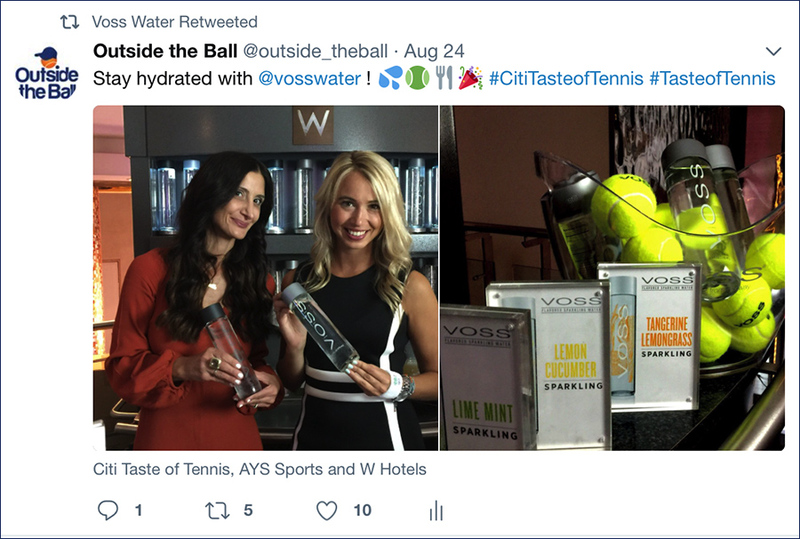 Citi Taste of Tennis sponsor Voss Water has been keeping the tennis players and fans hydrated at Taste of Tennis events across the nation. 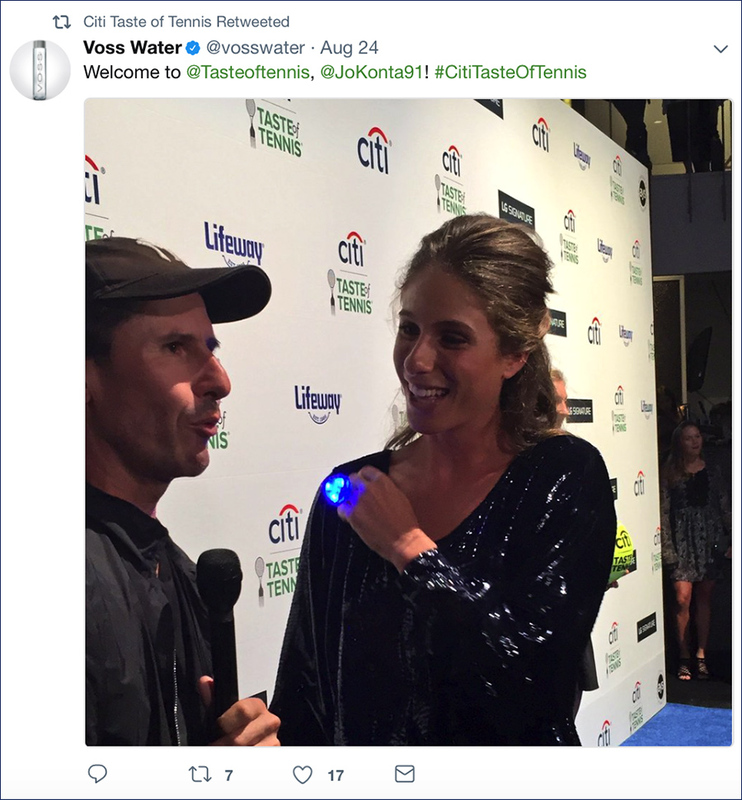 Voss Water shared our live coverage to their 27,900+ Twitter followers. 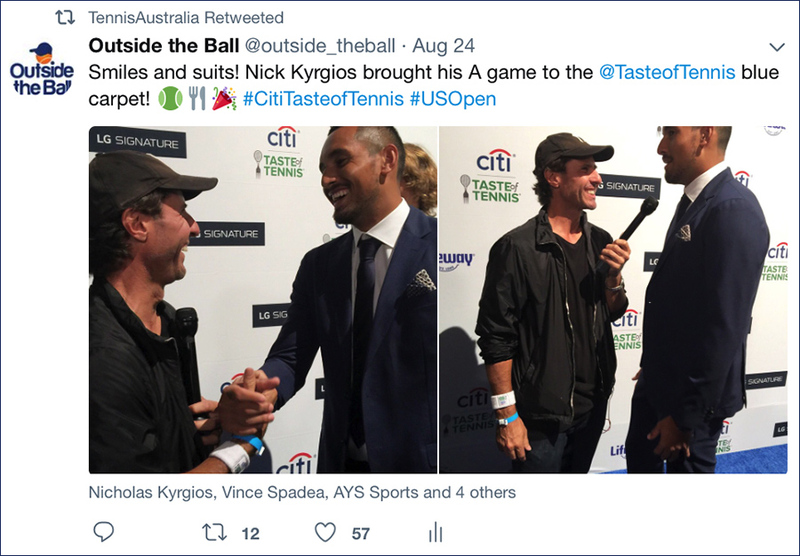 Tennis Australia shared a Tweet of Outside the Ball's Citi Taste of Tennis coverage featuring Nick Kyrgios to their 60,800+ Twitter followers. 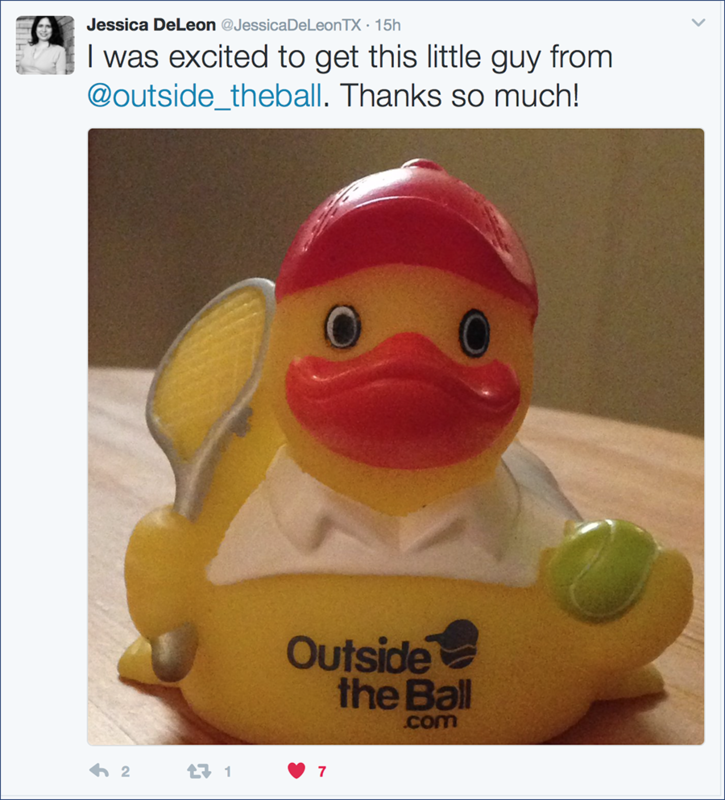 Outside the Ball toured the beautiful US Open grounds and captured some of the players preparing for the Grand Slam. 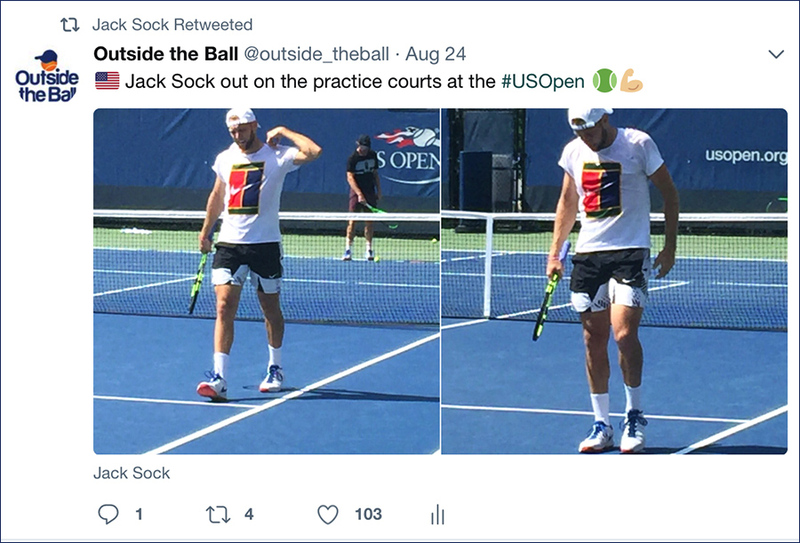 Jack Sock shared his practice coverage to his 77,600+ Twitter followers and Nick Kyrgios shared our tweet to his 293,000+ Twitter followers. 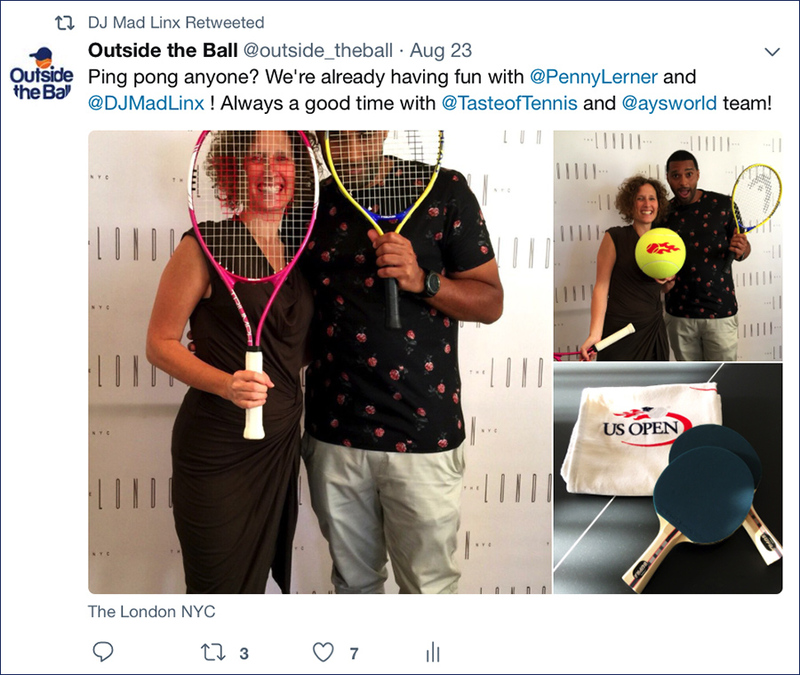 DJ Mad Linx is the music maker and microphone master for Citi Taste of Tennis events and he shared our live coverage from their table tennis event with his 19,200+ Twitter followers. 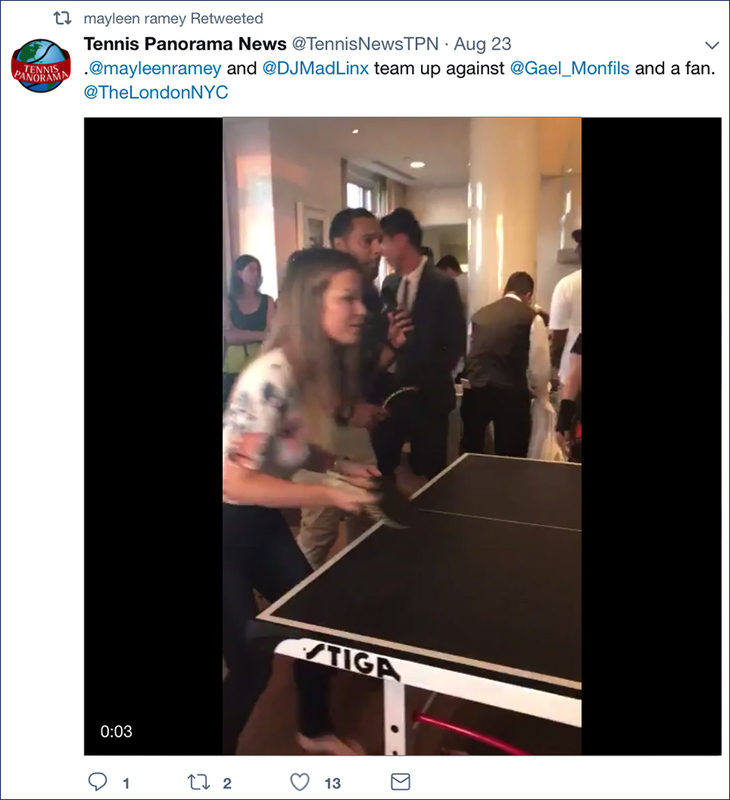 Tennis Panorama News filmed Outside the Ball host Mayleen Ramey as she jumped in to play table tennis with French star Gael Monfils at an event hosted by Citi Taste of Tennis. They shared the footage to their 22,100+ Twitter followers. Outside the Ball kicked off their US Open coverage with a fun game of table tennis hosted by Citi Taste of Tennis. 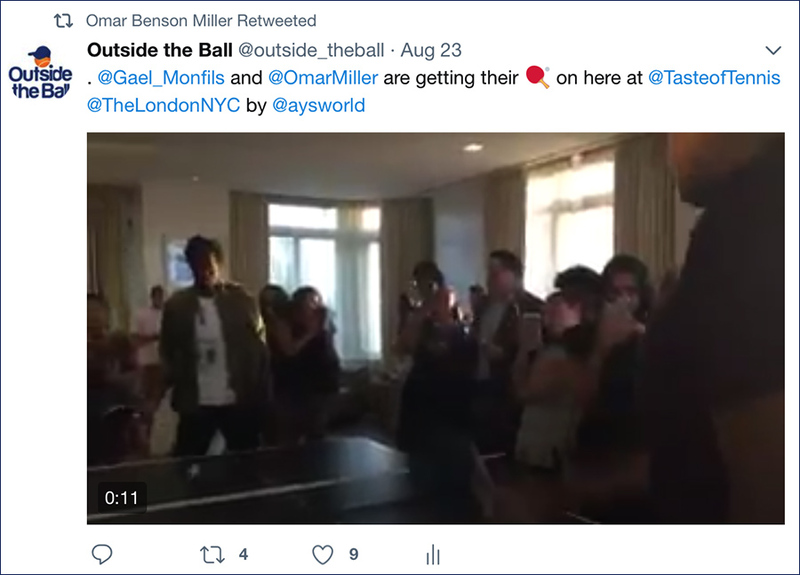 French tennis star Gael Monfils and actor Omar Benson Miller showed off their ping pong skills against one another. 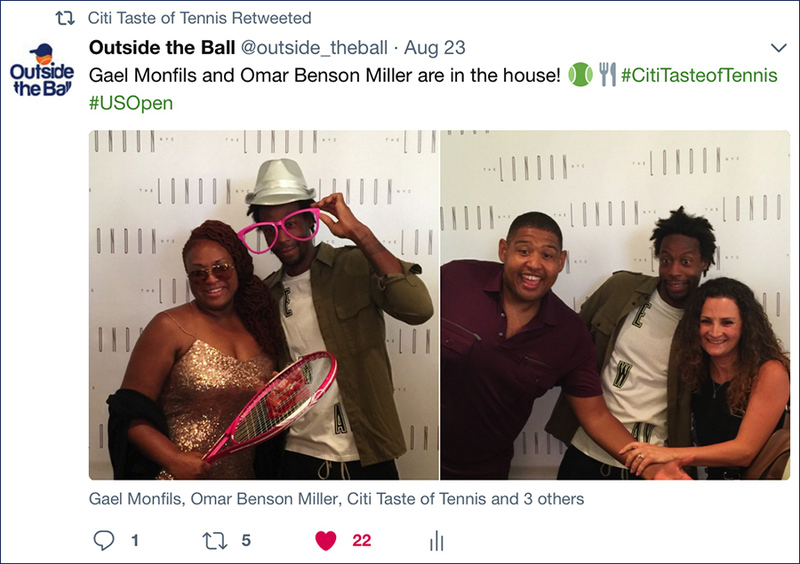 Citi Taste of Tennis shared our live coverage with their 6,246+ Twitter followers and Omar Benson Miller shared with his 66,700+ Twitter followers. During #BookLoversDay Outside the Ball asked fans to list their favorite tennis themed books or to respond with the book they were most looking forward to. 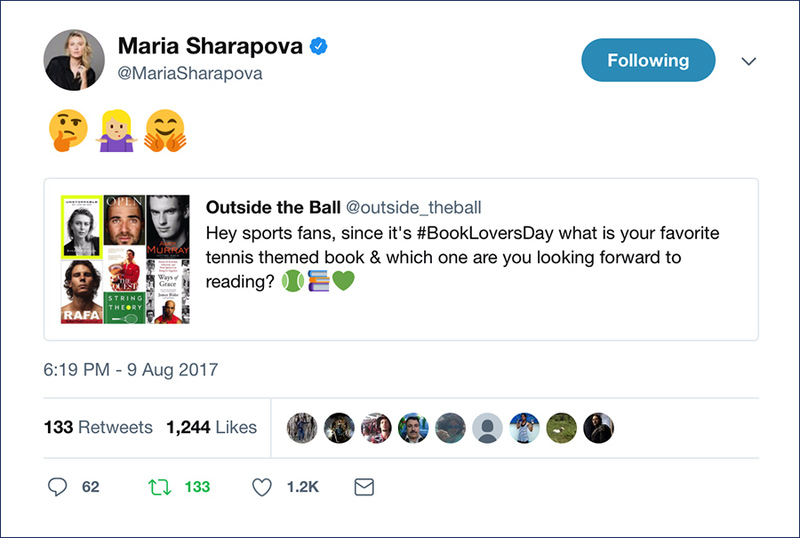 Unstoppable author and tennis star Maria Sharapova jumped into the conversation and soon tennis fans and bookworms were responding by the hundreds. 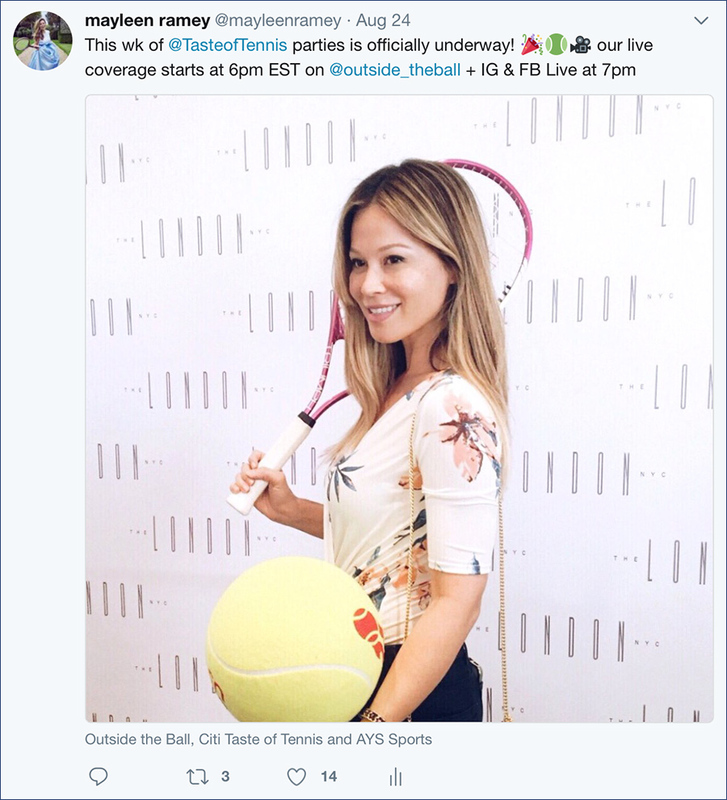 Sharapova had shared the tweet with her 7.6 million Twitter followers. 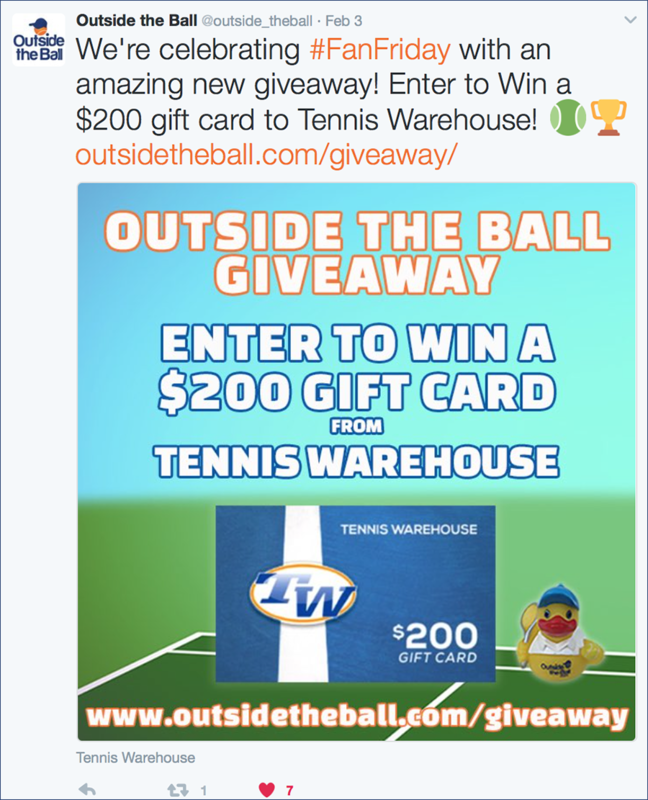 Outside the Ball and Tennis Warehouse partnered for our monthly giveaway and two lucky fans had the chance to win a $200 Tennis Warehouse Gift Card and Tennis Warehouse shared the giveaway with their 28,000 followers. Thanasi Kokkinakis is known for his amazing hair game and gave us a tutorial on how to do a perfect man bun. Thanasi shared our video with his 64,000 followers. Click to watch Thanasi Kokkinakis create the perfect man bun. A Tribute to Ana Ivanovic: Thanks for the Memories! 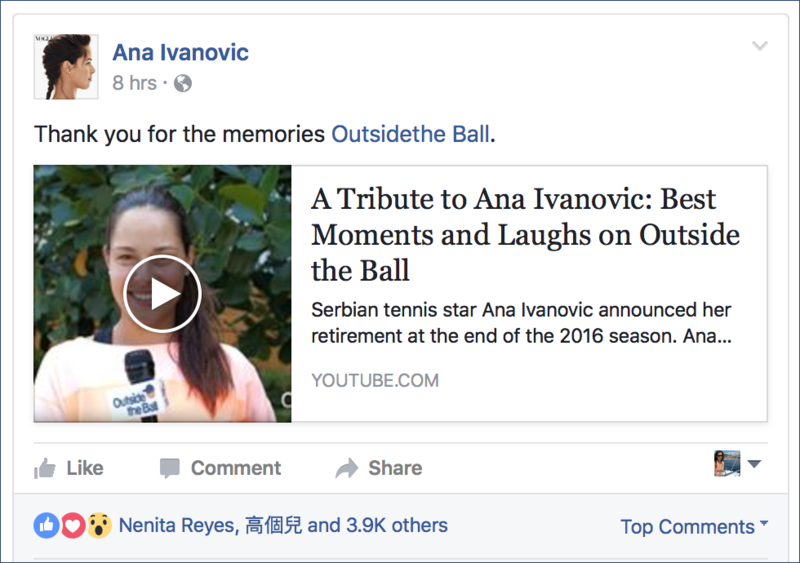 Serbian tennis star Ana Ivanovic announced her retirement at the end of the 2016 season and we created a tribute video in honor of her career. Ana shared the video with her 562,000+ followers. Click to watch the Ana Ivanovic tribute video. 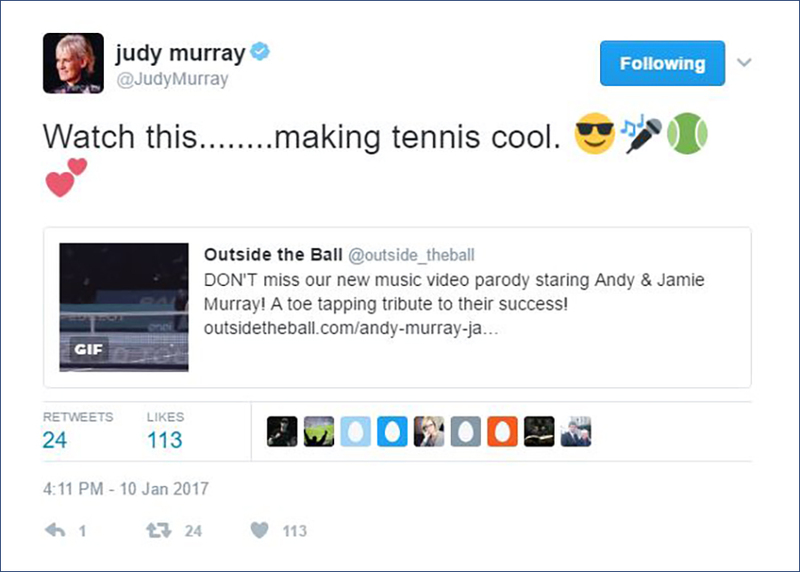 Outside the Ball created one of our signature music video parodies for Andy Murray and Jamie Murray featuring Ed Sheeran's "Don't". 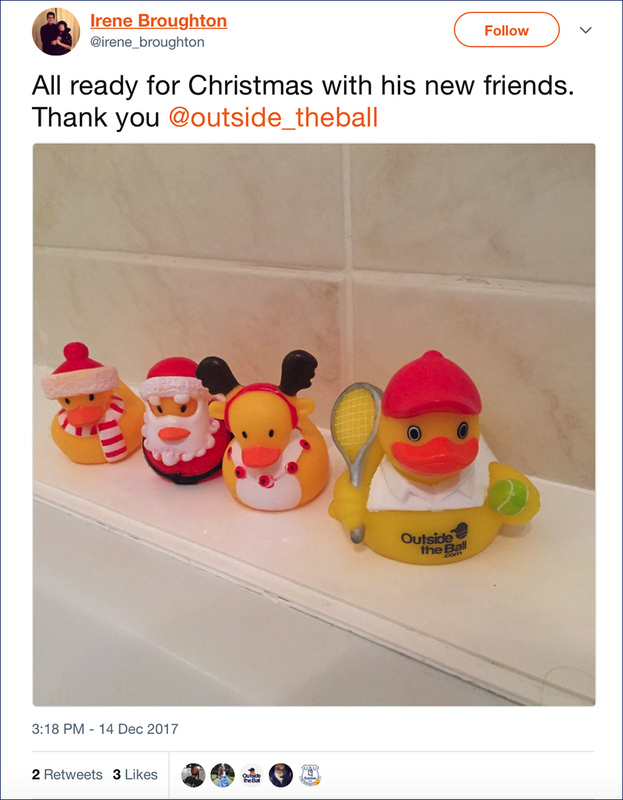 Tennis.com shared it with their 177,000+ Twitter followers and Judy Murray shared it with her 198,000 followers. 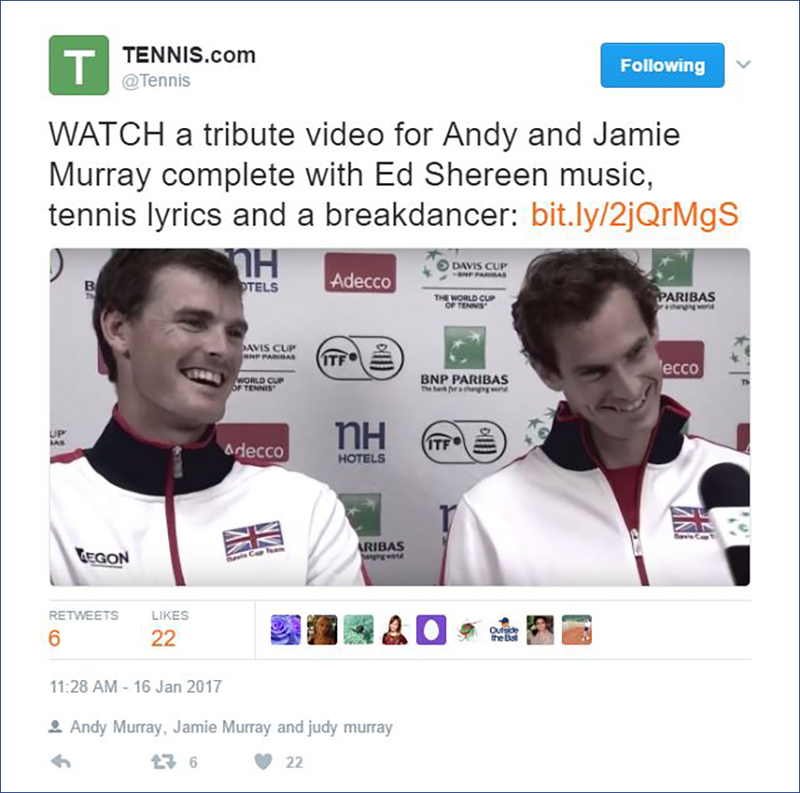 Click to watch Andy and Jamie Murray star in this fun music video that will give fans a thrill before they see these brothers hit the court next. 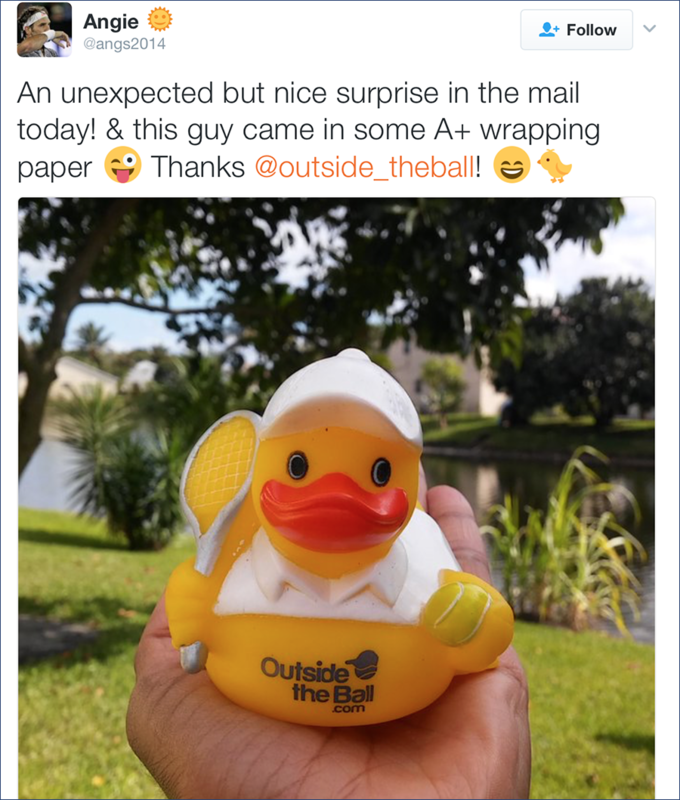 #ChuckTheDuck has traveled the world and arrived on the doorsteps of our biggest fans. 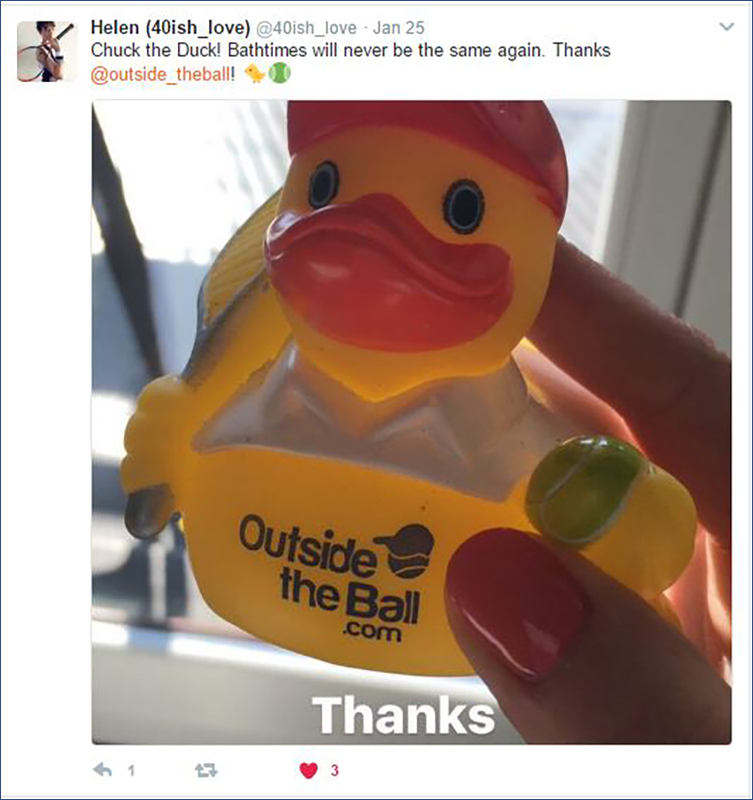 Instead of a quack, Chuck fans sent out a tweet!